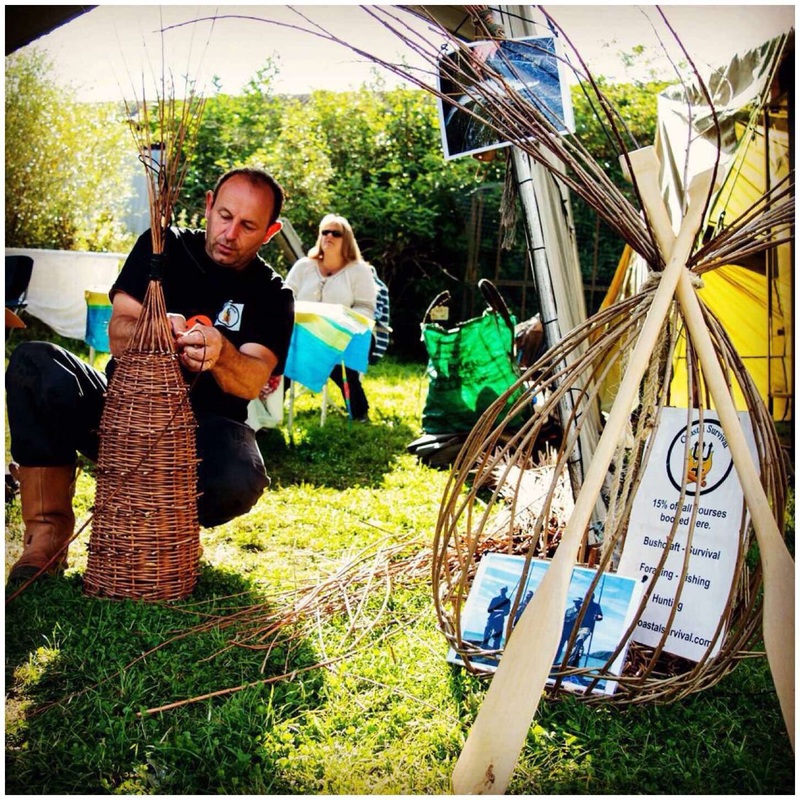 For ten years now I have been going to the BCUK Bushmoot and I have had great fun learning new crafts, making some amazing constructions and occasionally dabbling in a bit of art. This post cannot do justice to the wide variety of crafts, constructions and artistic endeavours that are undertaken however I have trawled through my picture library to try my best. One of the most talented carvers who attends the moot regularly is Dean Allen. 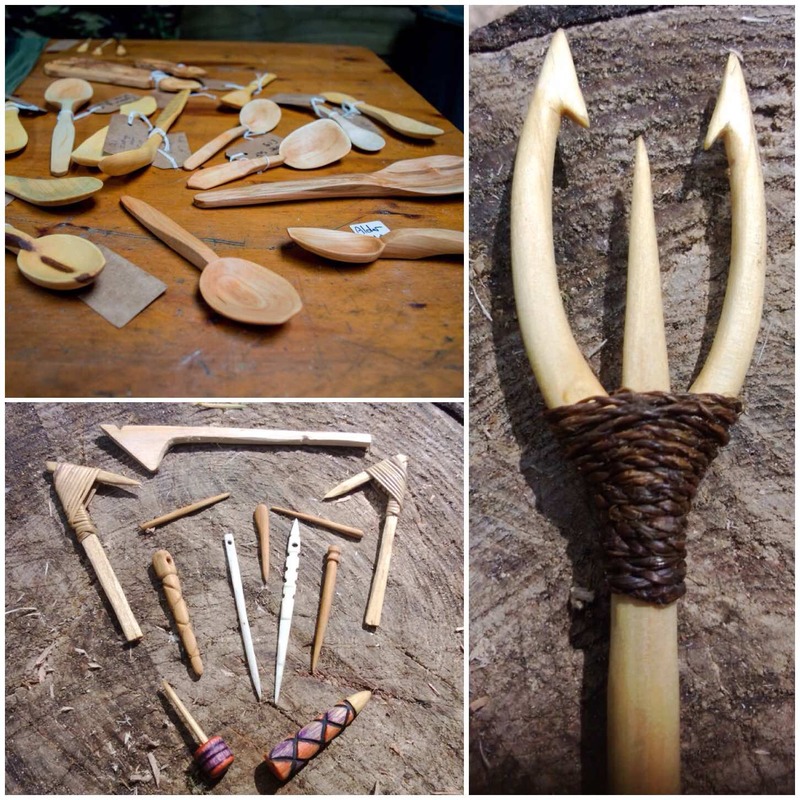 Dean makes beautiful spoons (particularly Welsh Spoons) and some fine primitive crafts as well. 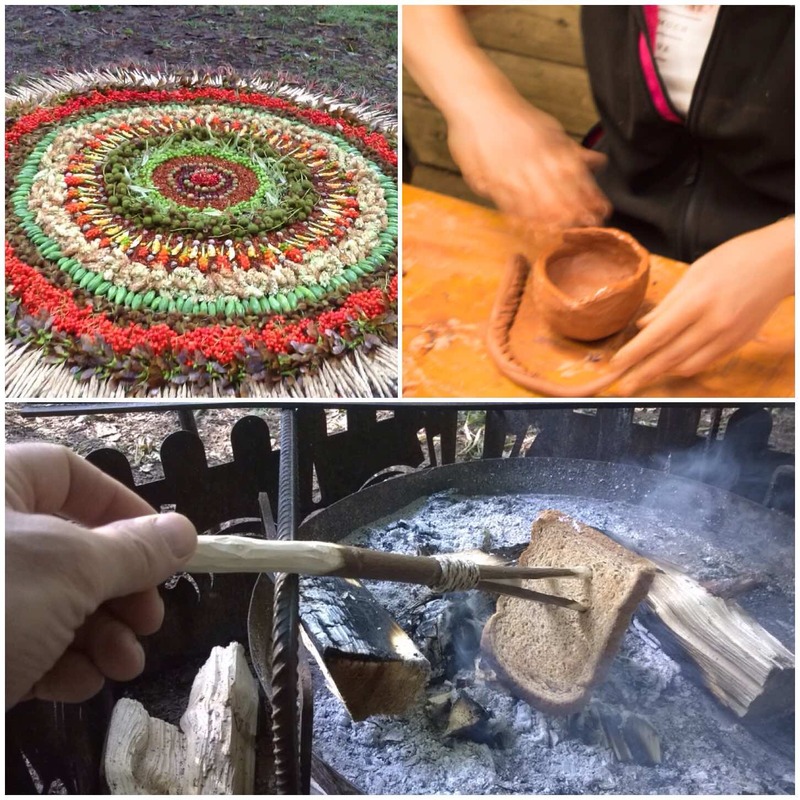 Hands are always busy doing something at the Moot – twisting grass rope, weaving beautiful tablet bands, embroidering flags and constructing clay pots – to name just a few activities. 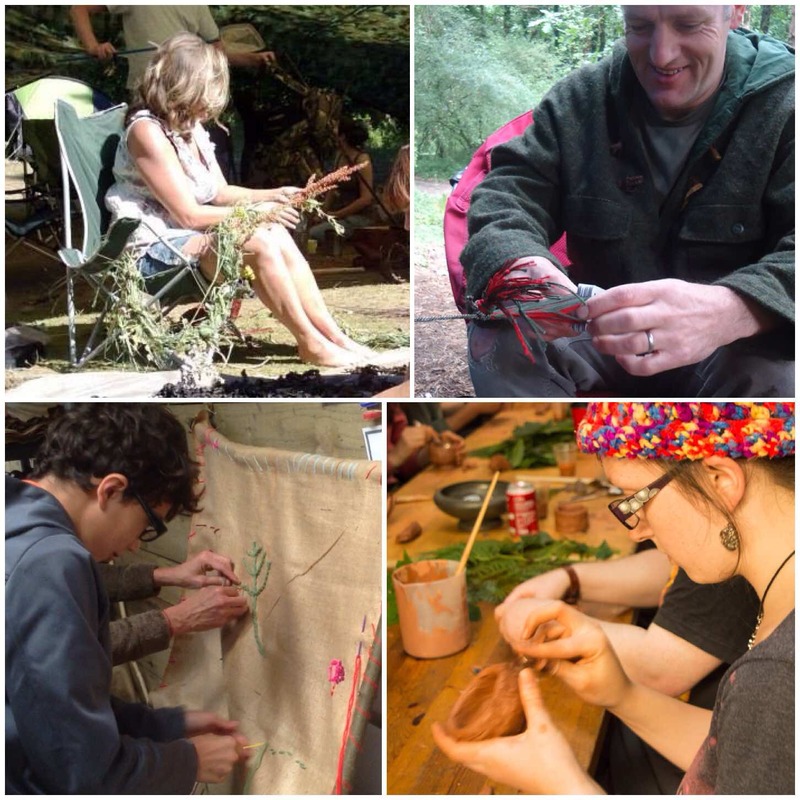 I have attended the classes with Perry McGee on grass rope making and tablet weaving with Susannah Parsons. 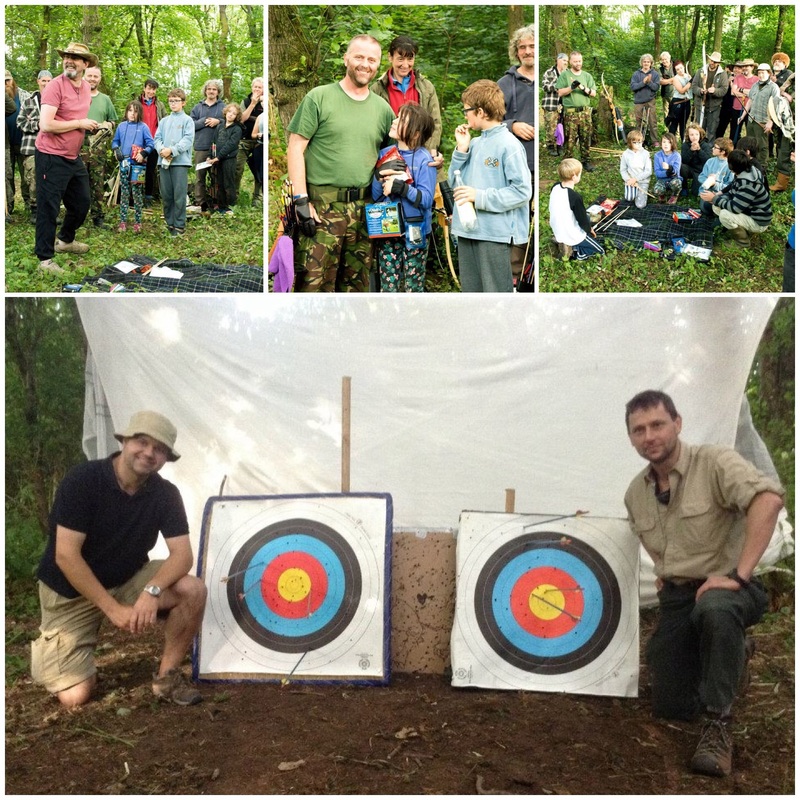 Both classes were hugely enjoyable as these instructors are experts in their craft. 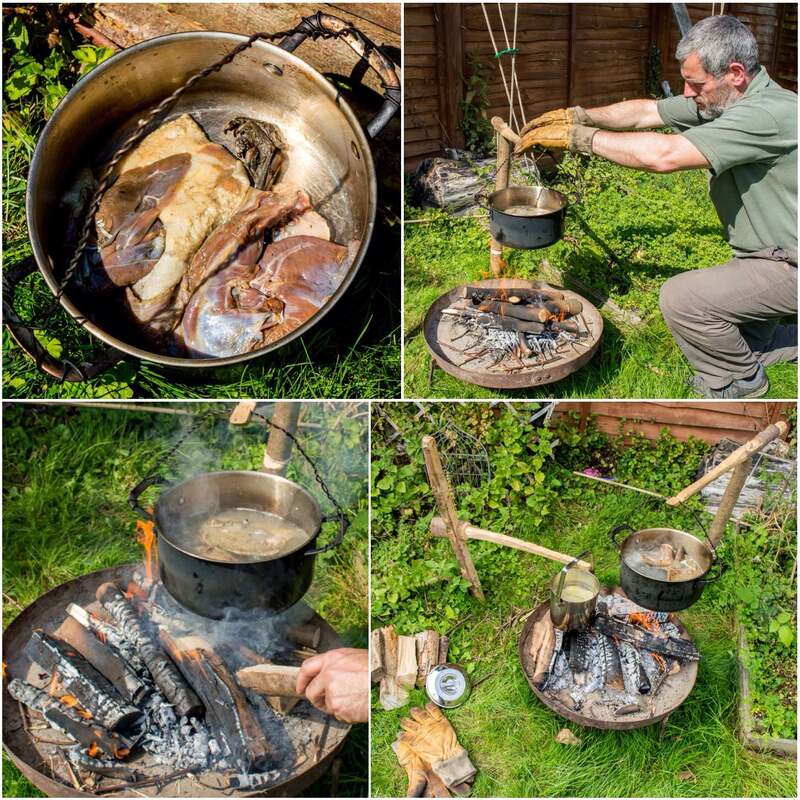 I have dabbled in animal hide work from scraping to tanning, and I know it is hard work (see my earlier blog How To….Make Buckskin from a Deer Hide). Theresa Kamper however makes it look so easy. 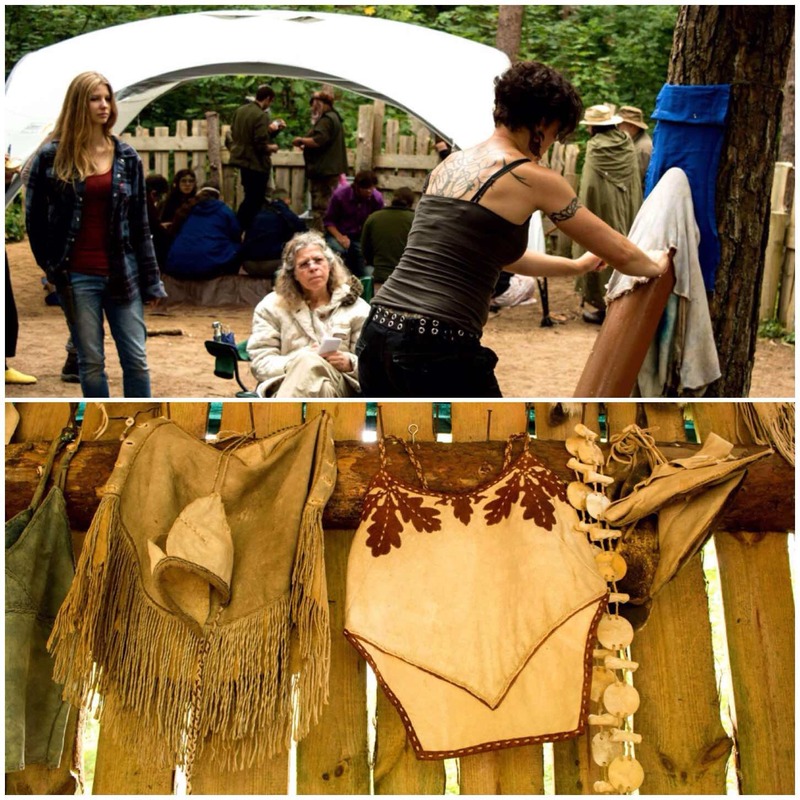 She studied everything to do with working with animal hides for her PhD and is fantastically knowledgeable on the subject of everything we regard as ‘Primitive Skills’, and is happy to share that knowledge at the Moot. 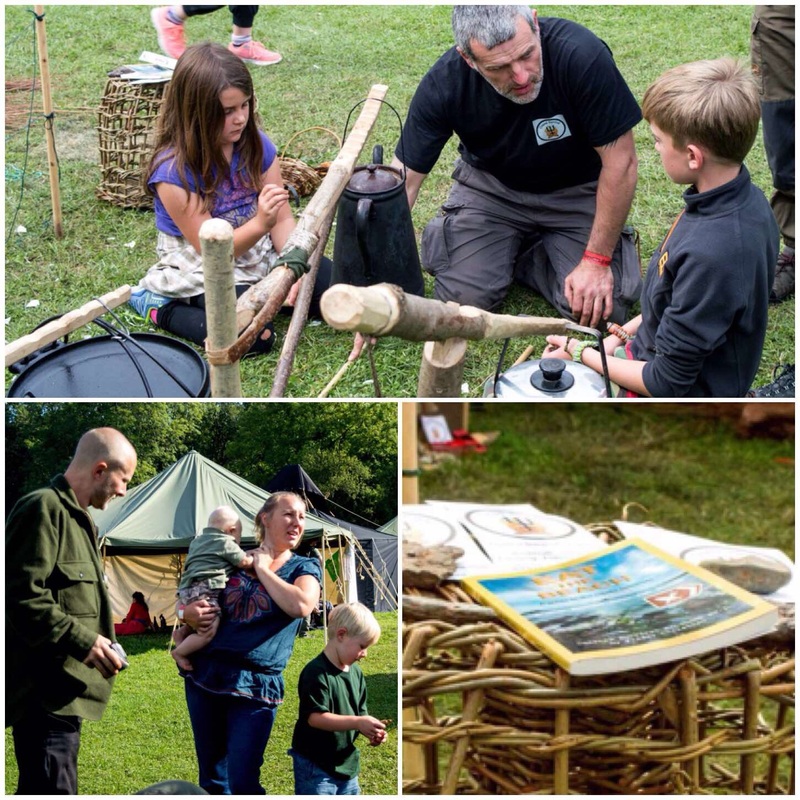 Basket- and lobster-pot making is very popular at the Moot. 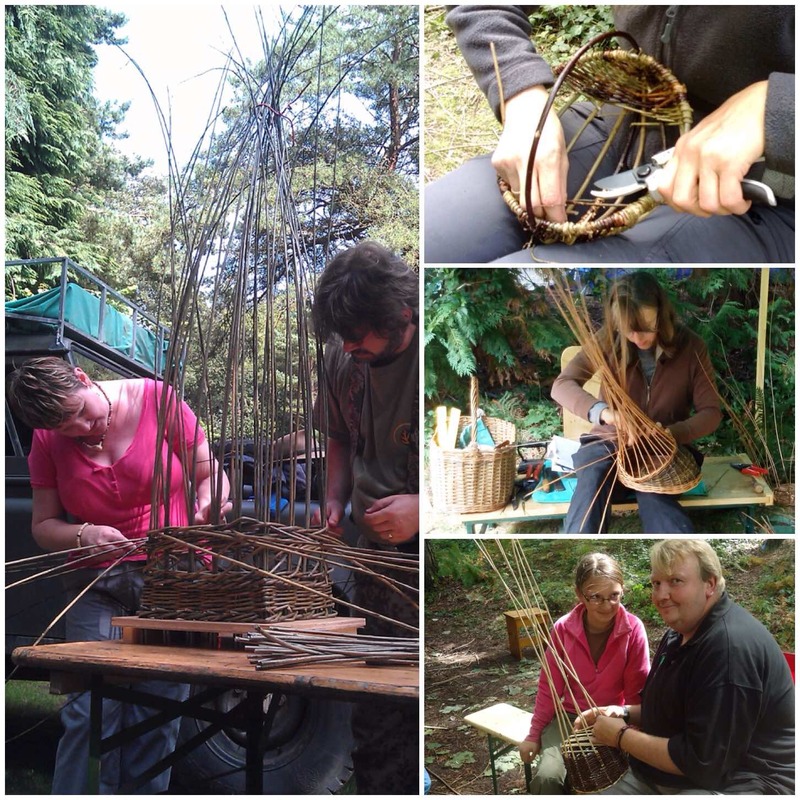 Our regular instructor on this is Julie Wagstaff from the Welsh Willow Works. I have never had the time to do one of Jules’s classes however everyone I have spoken with has really learned a lot from her. Jules has a really patient nature and a very creative pair of hands. One day of the Moot is set aside as Traders Day. 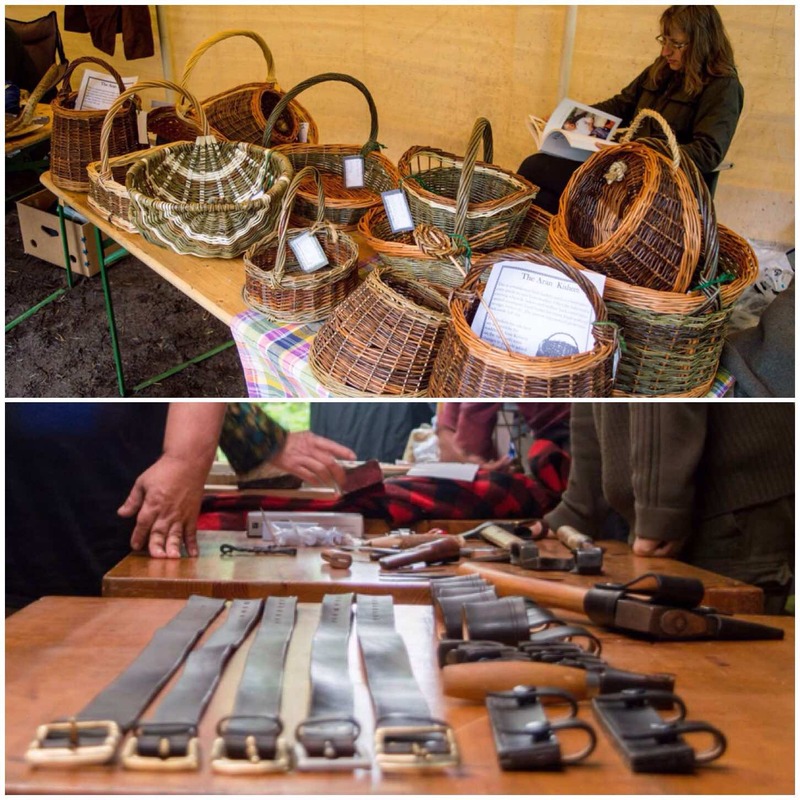 The Moot is not a particularly commercial event for traders however we do have a small shop open most days with a bring and buy stand. On Traders Day many of the members set up a stand to sell their ‘wares’. Some of this is second hand, others have brand new bought-in goods, and a few sell their own creations. Some of these items like the baskets and the leather work you can see below are highly crafted and intricate. 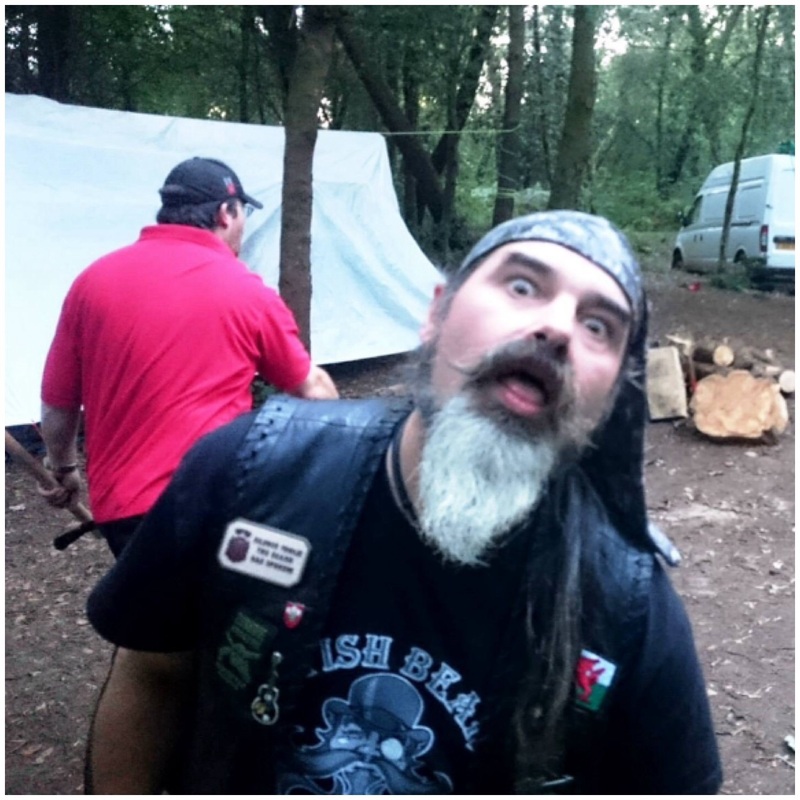 A post on craft cannot be complete without mentioning Mr Dave Budd. 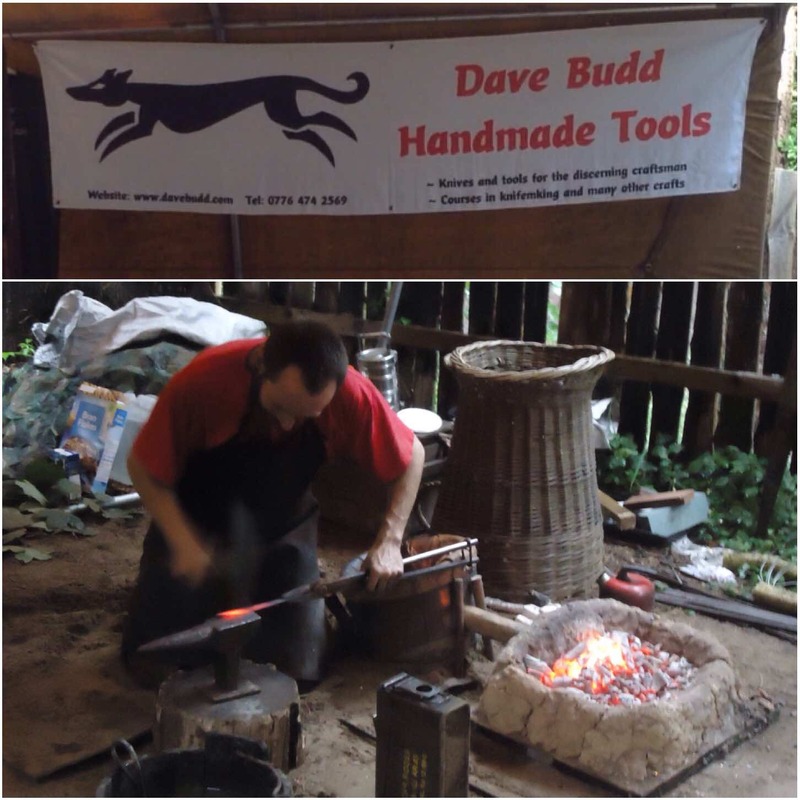 Dave is a master craftsman when it comes to metalwork, Using only the most rudimentary (but highly suited to the job) equipment he runs his own forge for us every year. 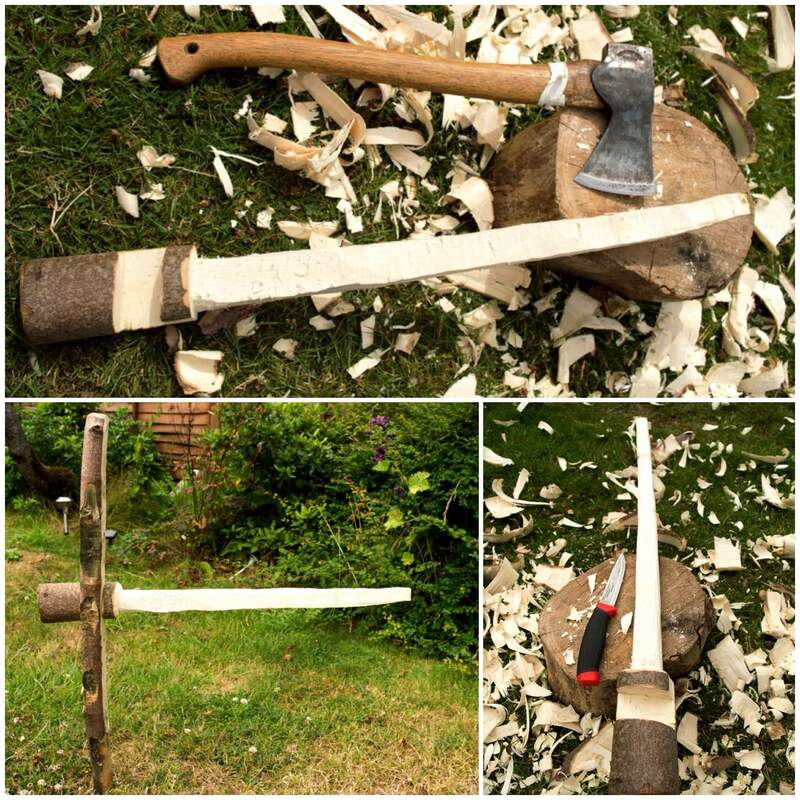 Dave makes excellent knives and other woodland working tools. 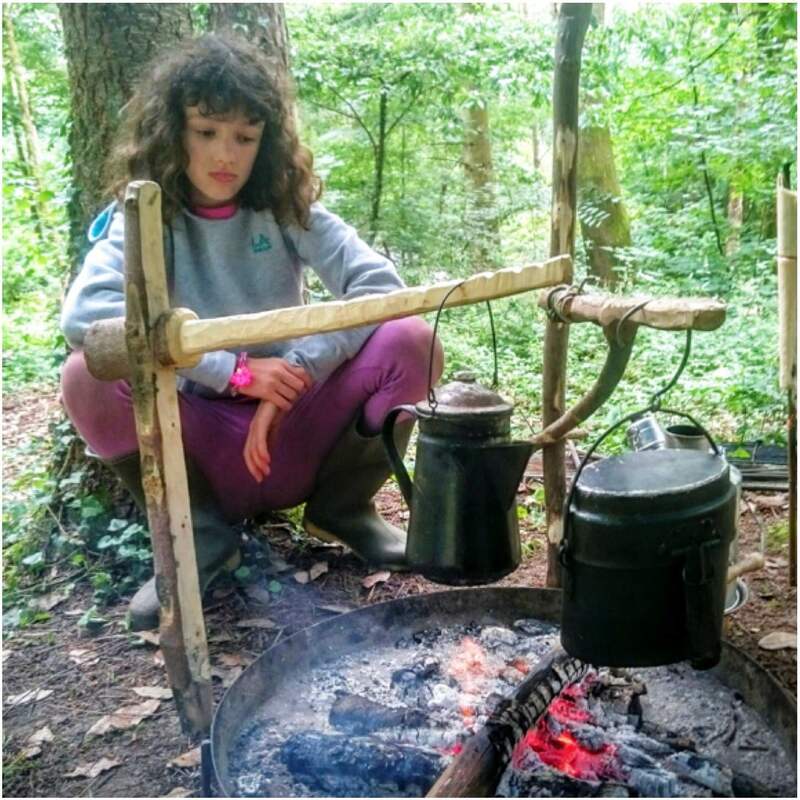 My daughter Catherine enjoys being the ‘Pump Monkey’ – keeping the pump going to heat the forge. 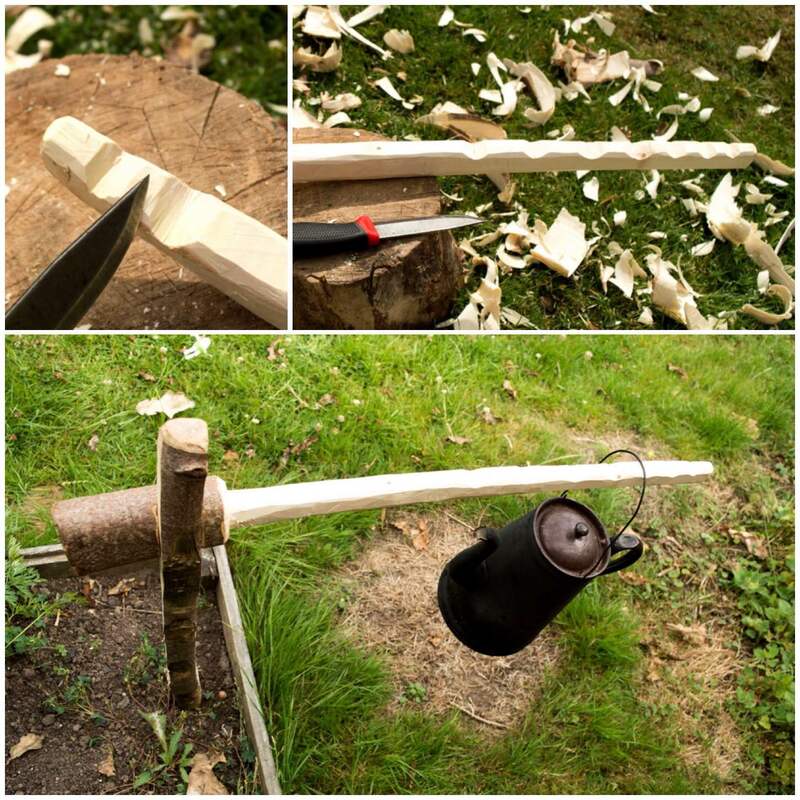 Dave also donated this year a beautiful knife and a bodkin arrow point as prizes for the archery competition. Another metalworker who is starting to experiment with this material is my Bushmoot neighbour Ian Woodham. 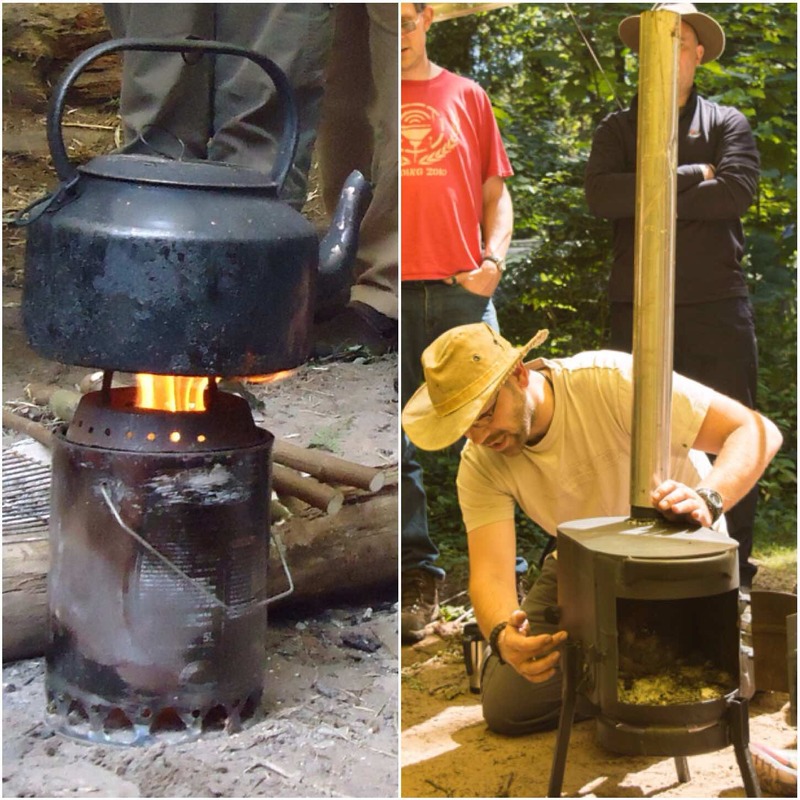 A few years ago Ian showed a class I was running how he built a gas wood-burning stove out of a paint can. 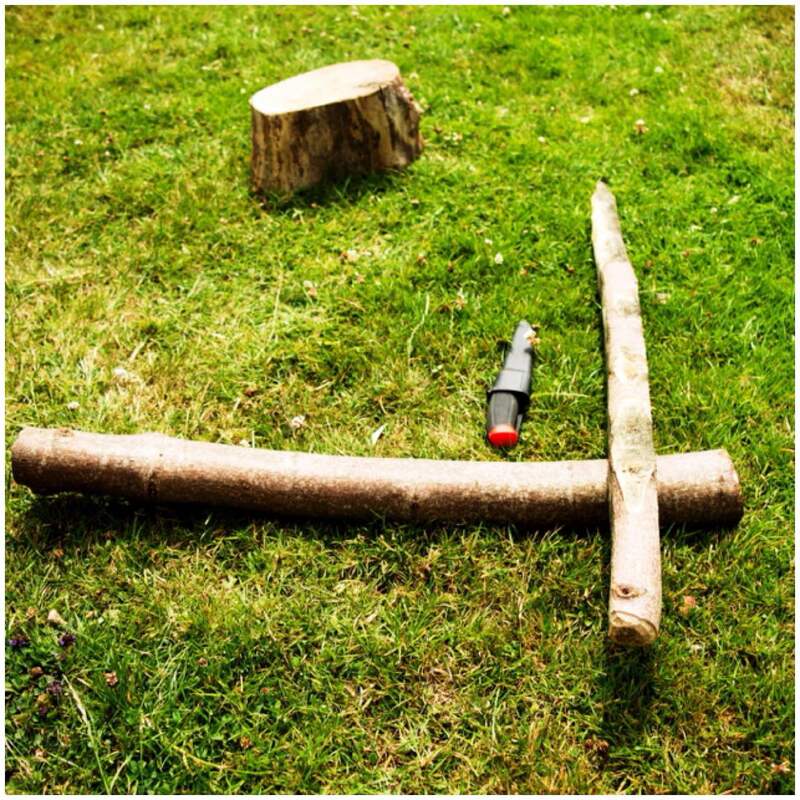 I was so impressed with it that I made one myself and wrote a tutorial on it – How To….Build a Wood Gas Stove. 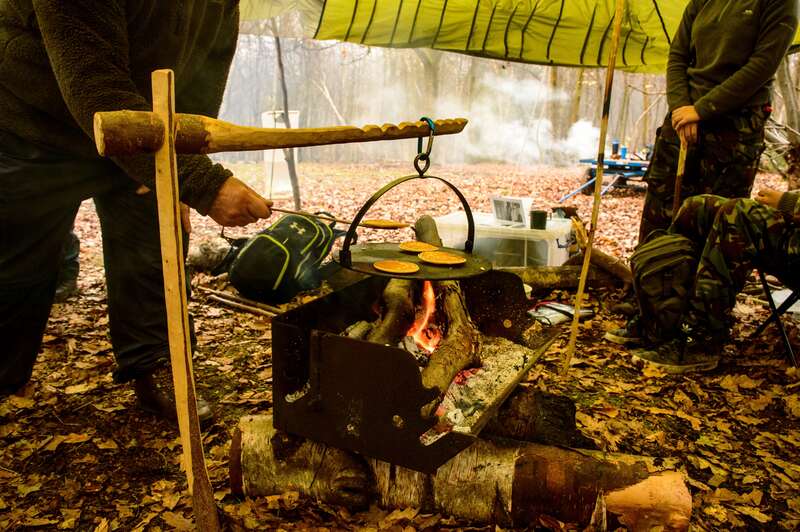 This year Ian brought along a new stove he had built out of two gas bottles. The stove had a burner on one side and an oven on the other and I can confirm it did make excellent pizzas and cakes. Since then he has built another one which I am hopefully going to be trying out soon (as soon as I can figure out how to transport it from Yorkshire to Hampshire). We have had a number of leatherwork instructors over the years however Eric Methven has been teaching this art at the Moot the longest. 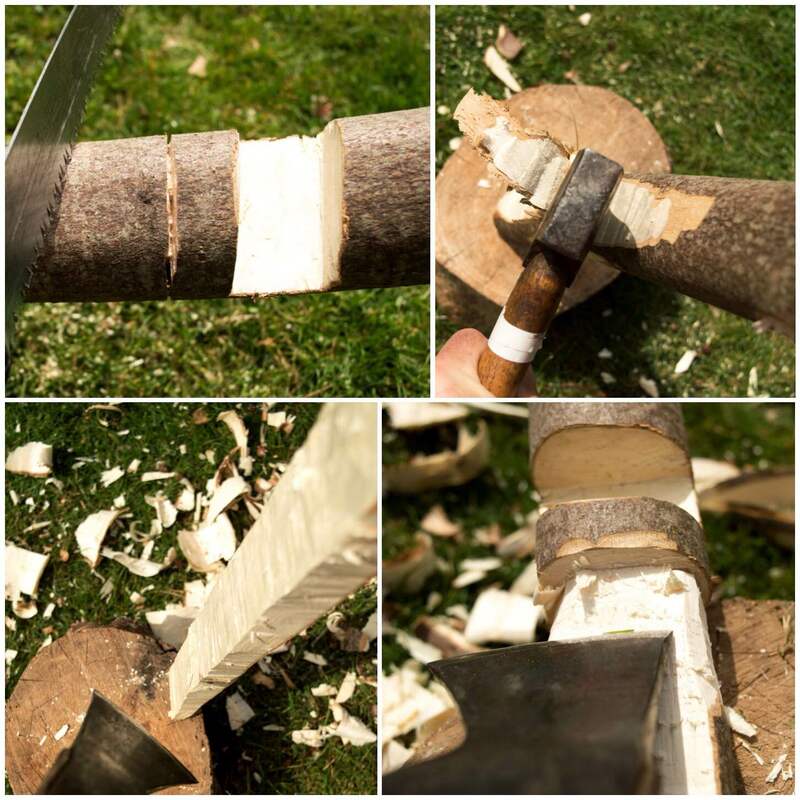 Eric can turn his hand to most things when it comes to working with leather from water bottles, tankards and sheaths to the likes of beautiful arm guards for archery (we got one of these guards as a prize for the archery competition one year). Our good friend Drew passed away a few years ago and he was a keen student of Eric’s. I still remember clearly Drew coming up to my camp to show me the new sheath he had just made for his Leatherman multitool. 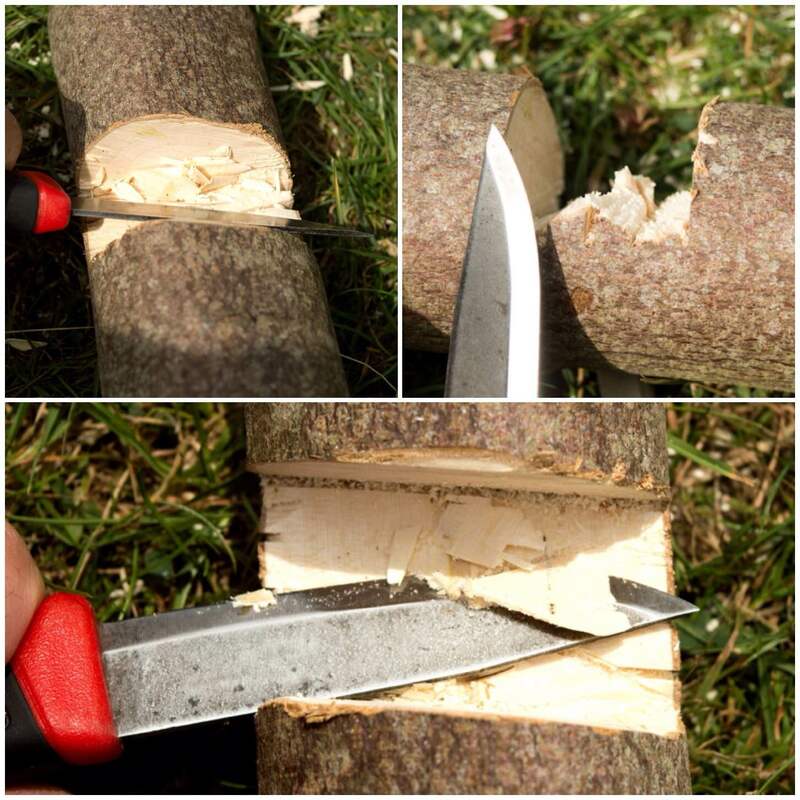 No Moot would be complete without some spoon carving. Our expert carver is Dean however quite a few of us lend a hand with this class. 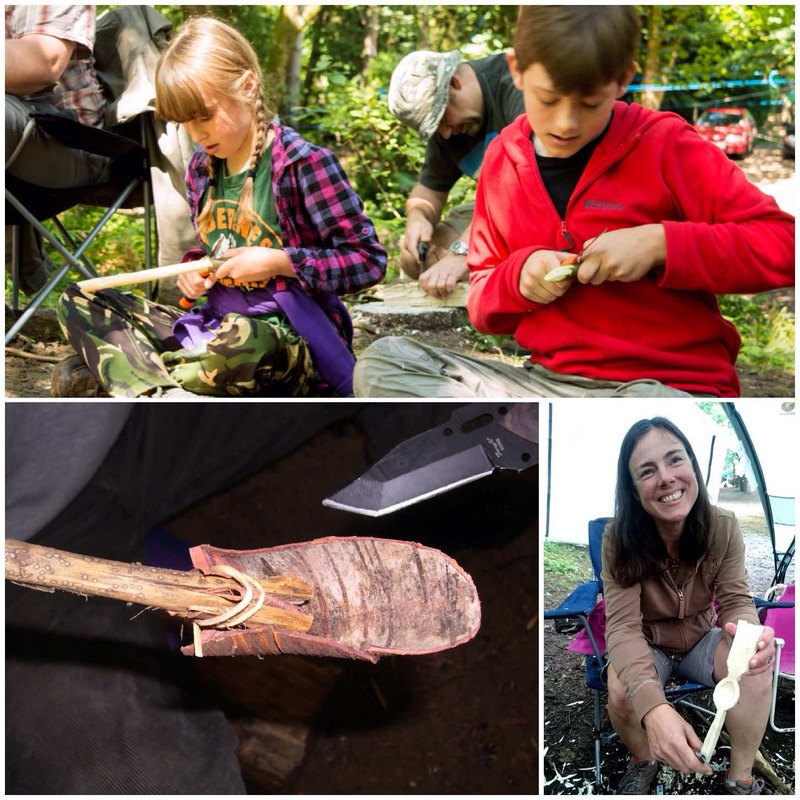 It is great to see all the kids learning to carve their first spoon (and adults too – that is my wife Alison with her first spoon below). 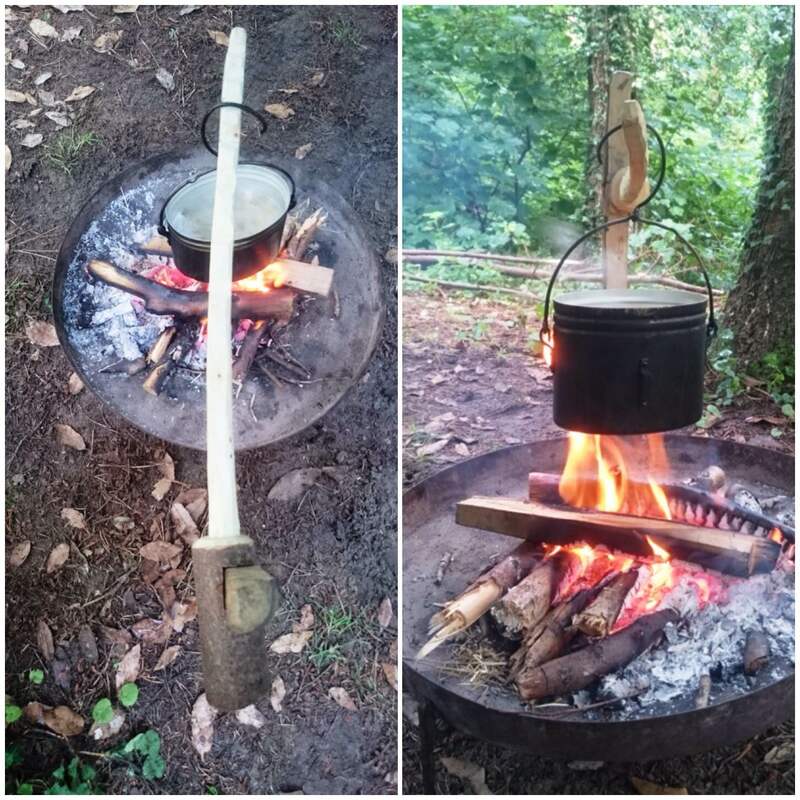 My first spoon at the Moot (way back in 2005) was quickly constructed from birch bark. It did not take long to make but it did impress me. 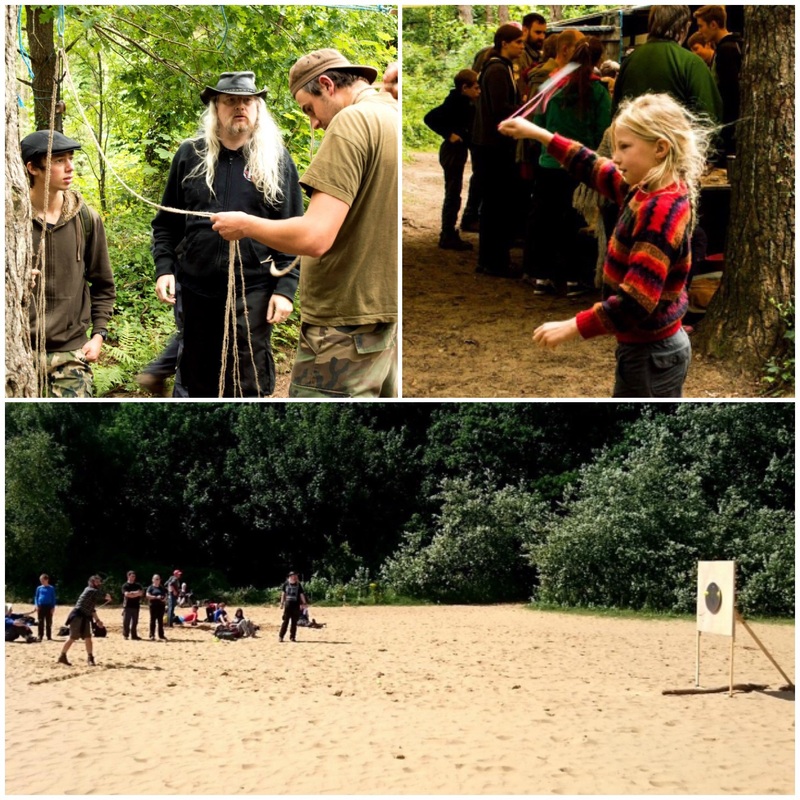 I ran a competition one year where everyone was tasked with constructing something for a bushcraft camp. There were many entries and you can see three below. 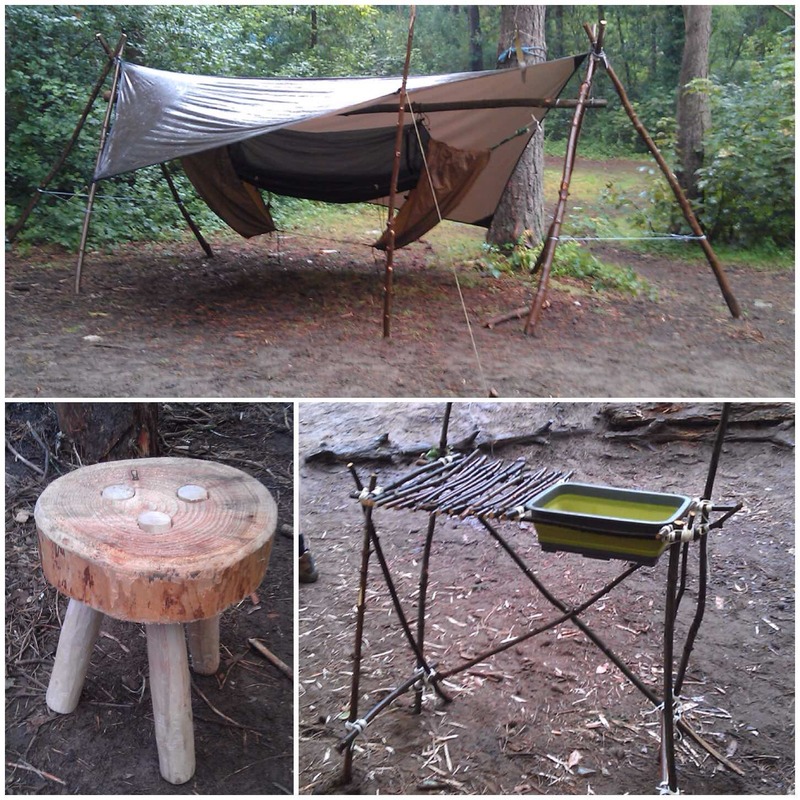 I loved the little stool and the washing rack, which had a lot of love and care put into its construction. My entry was this freestanding hammock stand (no land anchors were needed) . A couple of other construction projects have been around the theme of cooking. Tim Neobard built this fantastic pizza oven out of clay and straw last year. It baked some excellent pizzas (sadly some idiots smashed it up after the Moot finished). Happily the oven was re-built by Neil this year using bricks as a skeleton so hopefully it will last for a few years. 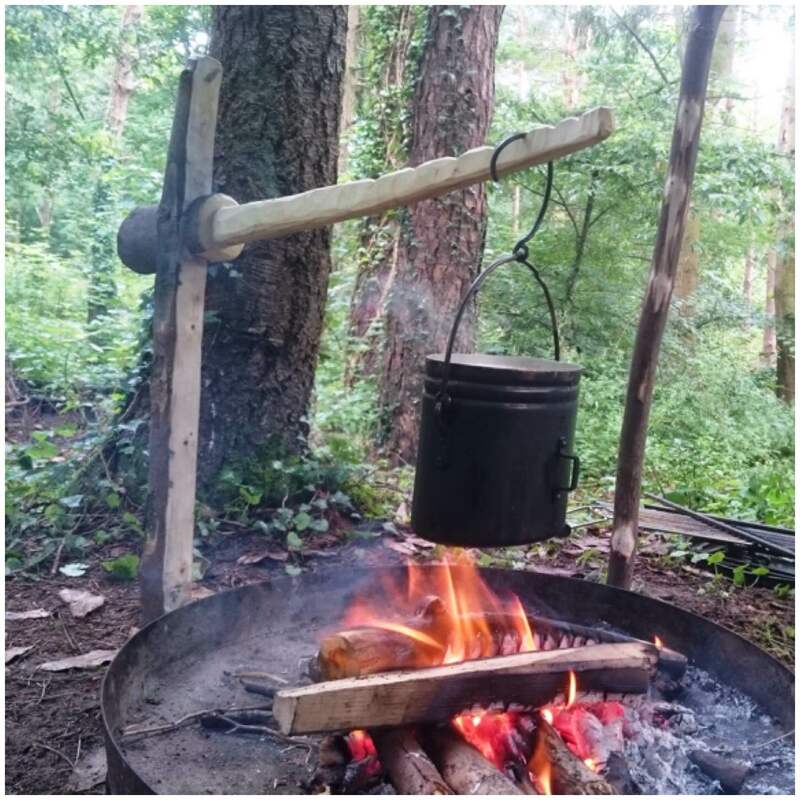 My project this year has been on building campfire cranes and I tested out my Lap Joint crane at the Moot. 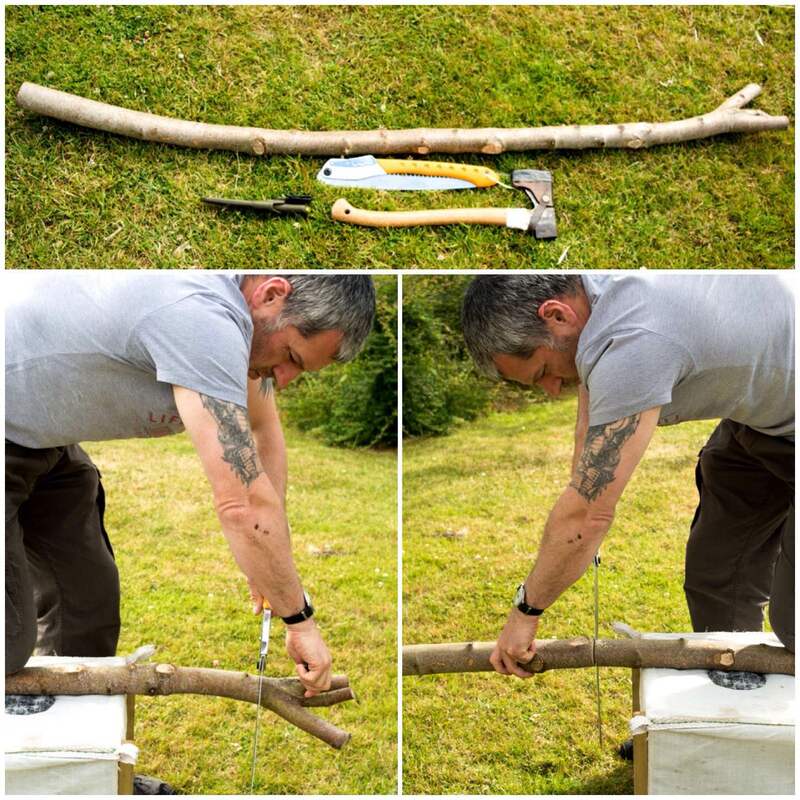 It is a very simple device made out of one pole and I am happy to say it passed with flying colours. Since then I have been busy building other cranes with as many variations as I can think of. 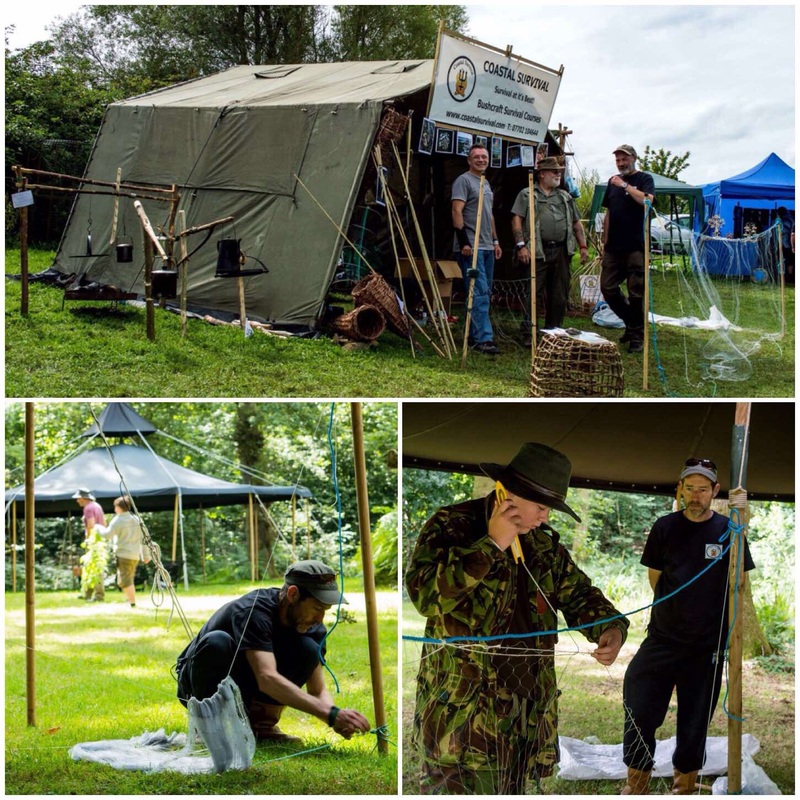 One thing you can be guaranteed about at the Moot is being astonished by the numerous things you can do with string, be that Dream Catchers, crochet or making whoopie slings. We also had David Colter making Balearic slings out of string at the Moot and running a competition with them. 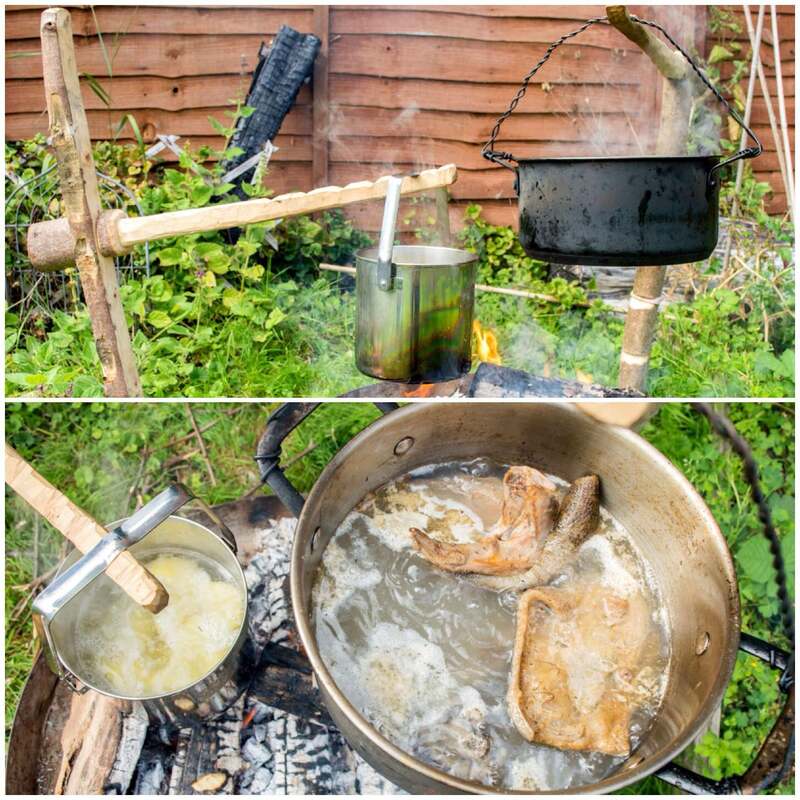 Most bushcrafters are quite happy at the Moot to show you what they think are the best knots to use in any given situation. A very quiet craftsman is our very own Cap’n Badger. 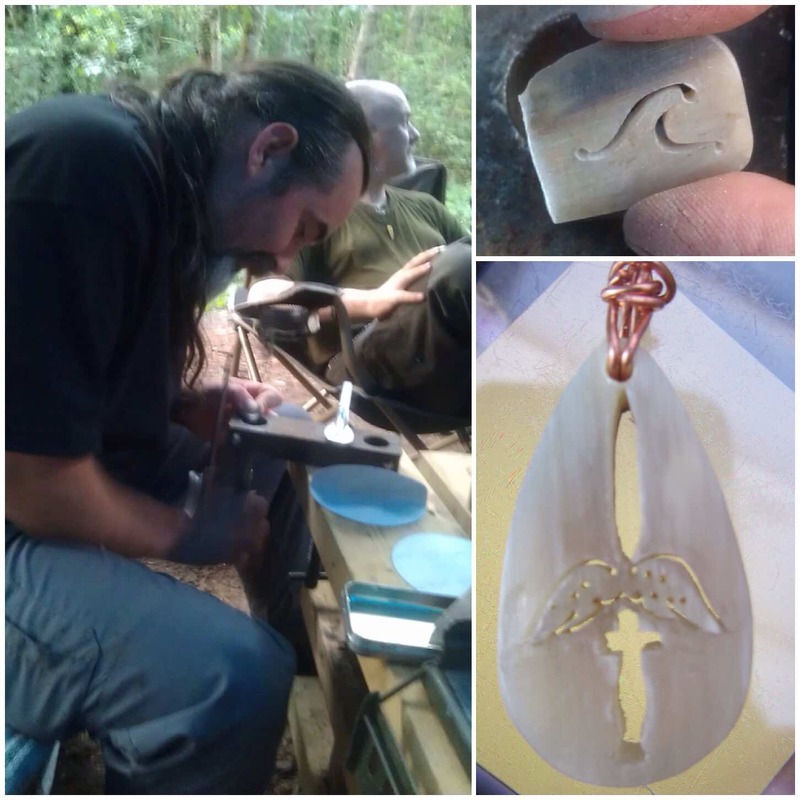 He uses a fine saw to carve bone and antler into beautiful pendants. You can see a couple of his designs in the picture below. The pendant on the bottom right is the one he carved for me a few years ago. The design was very intricate (a Royal Marine dagger and parachute wings). 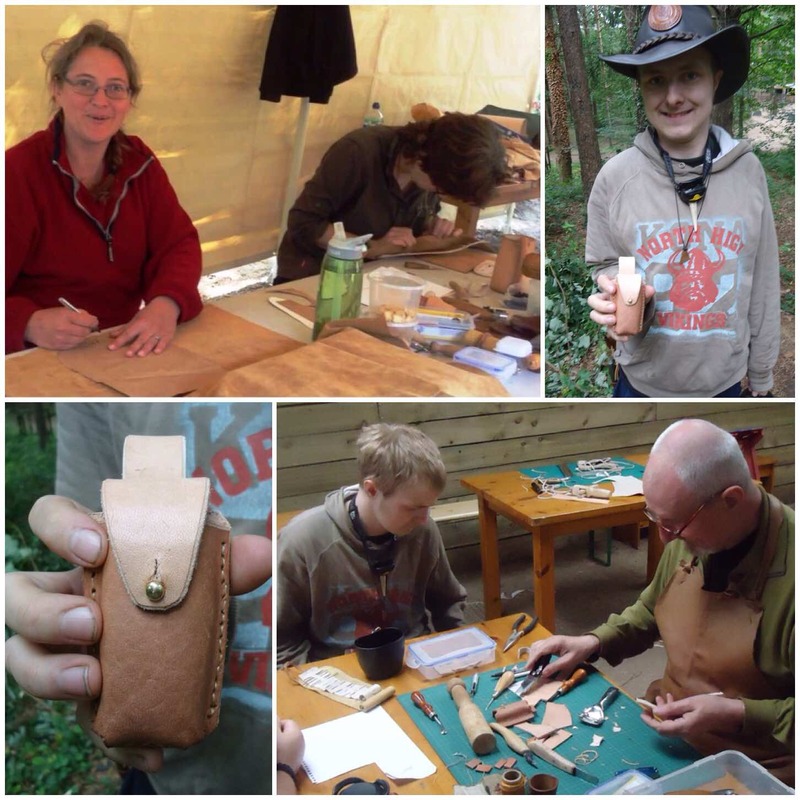 Badger also made some more pendants this year and donated them to the archery competition where they were quickly snapped up by the competitors. Now it is not all hard graft when it comes to the Moot. Last year my friend Richard brought along a number of his bottles of white elderberry wine. I managed to get a private tasting session and I was very impressed with the quality of the wine that he had produced. Richard has managed to cultivate his own ‘orchard’ of elder trees that produce white elderberries. This has taken him years to do and it has paid off for him with some excellent wine. 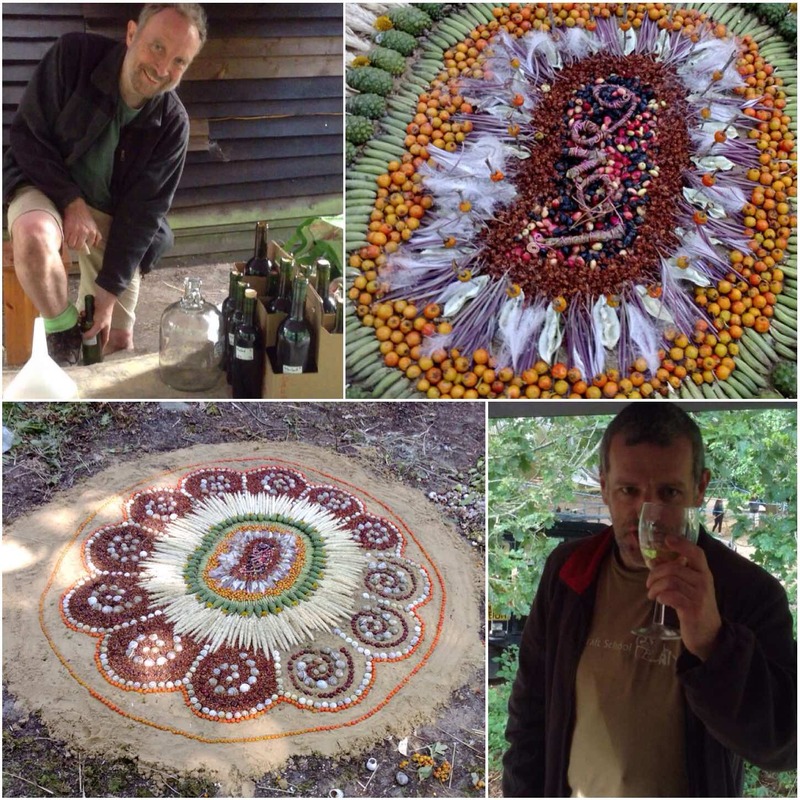 I think though that the most beautiful sight you will come across at the Moot must be the fantastic mosaics of plants made by Keith Beaney (Keith refers to them as Land Art and you can see why clearly). Keith will spend hours producing these wonderful spectacles for us to marvel at. 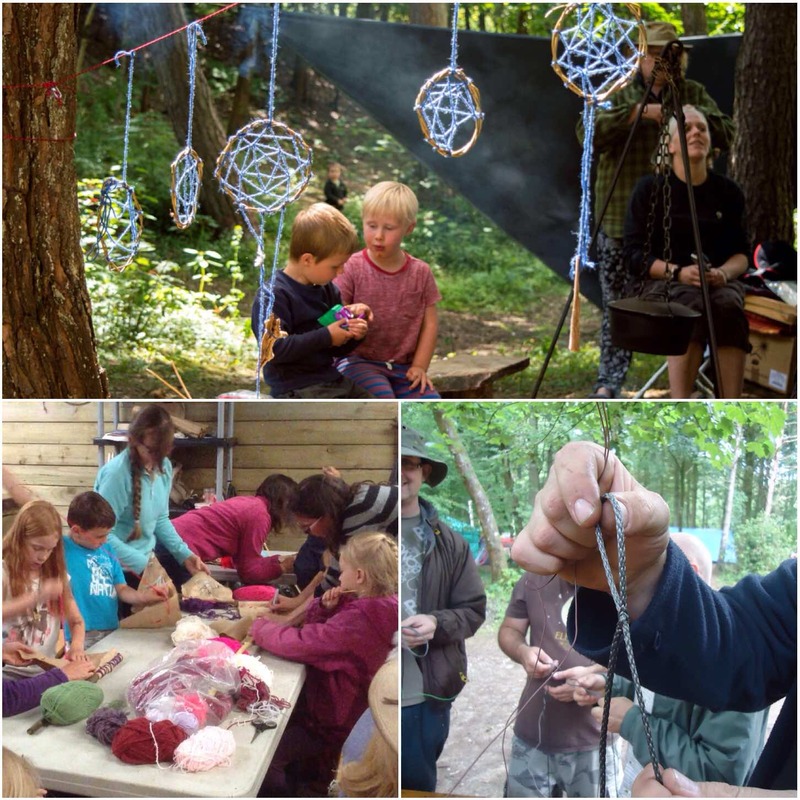 Many of the children head off to collect materials, inspired by his creations, and leave their own mosaics dotted around the woods. I could have added lots more on this subject but I have to end somewhere. I am looking forward to next year when I can practice some of these arts and crafts again and learn new ones. 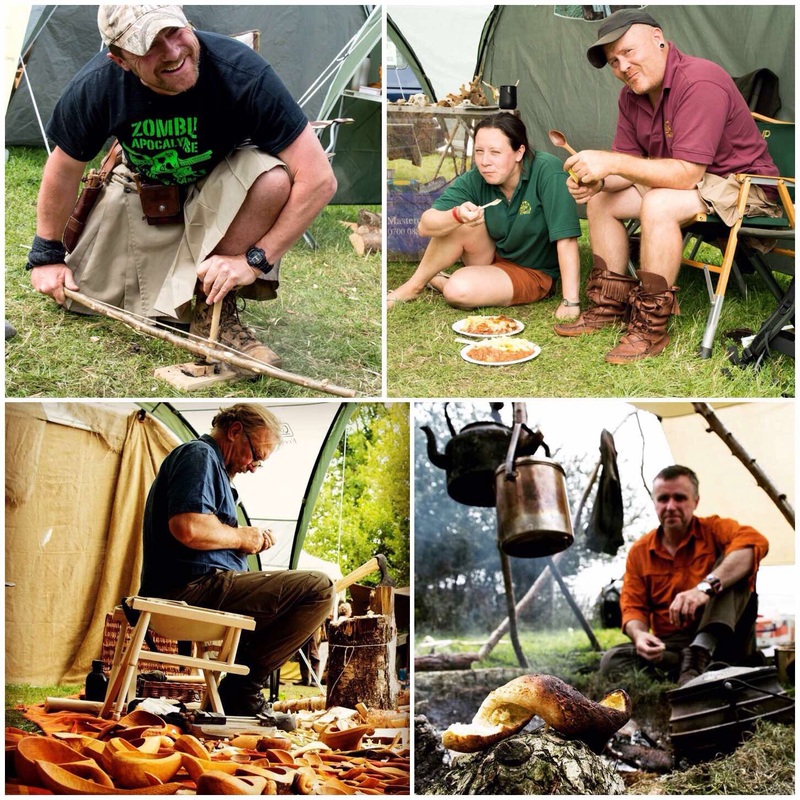 Last August found me back at the Wilderness Gathering with my good friends Fraser Christian (from Coastal Survival), Stephen Herries, Danny Stocks and Si Parker. I have been going to the Gathering so long now that I feel part of the furniture (I did miss the very first one) but I would not miss it for the world. Work kept me busy this year so I did not get down to West Knoyle until the Friday so the guys had set everything up before I arrived. I also met Danny’s wife Lorna for the first time this year. 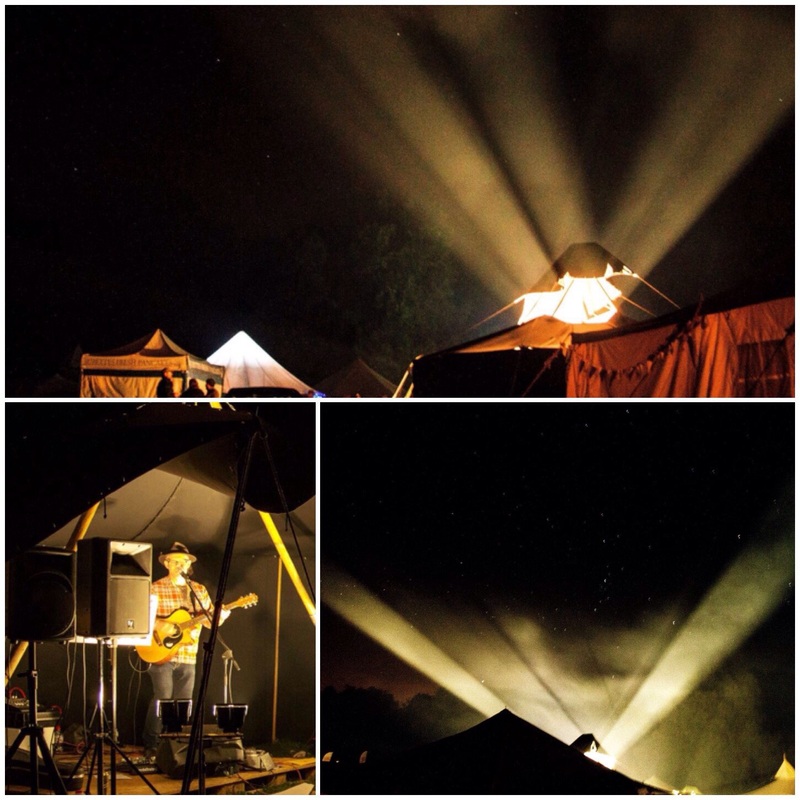 The Friday for me was a relaxed affair setting up my tent and catching up with old friends. That evening found us all relaxing to the music and light show from the band area. 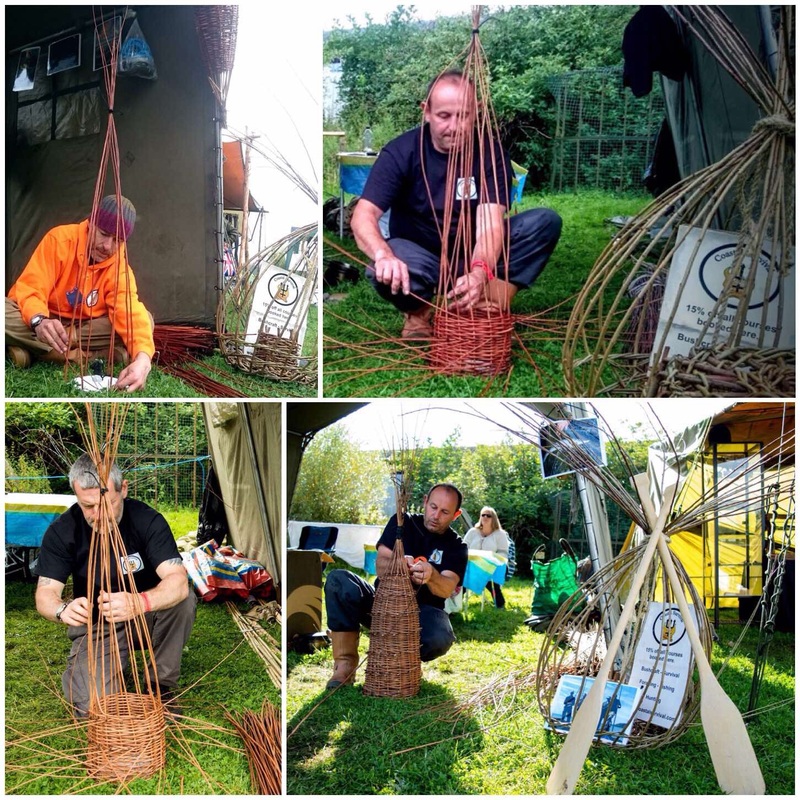 Throughout the whole weekend we would spend time weaving a willow trap for catching crabs and lobsters. This was harder than it looked and I must admit that Danny did the majority of the weaving. Last year Fraser had a cold smoker set up on his stand and this year he decided on setting up a hot smoker made out of a cardboard box. It is called a hot smoker as the small smudge fire that generates the smoke is inside the box as opposed to the cold smoker that has the smudge fire located outside of the box. Due to an algal bloom along the Sputh West coast of the UK we could not get fish for smoking however Fraser did get some delicious cockles from Scotland that he smoked. After smoking the cockles Fraser explained how he further preserved them using either oils or vinegar. The class he ran from the stand was well attended and I did not manage to get a taste of the cockles before they were all eaten by an appreciative audience. 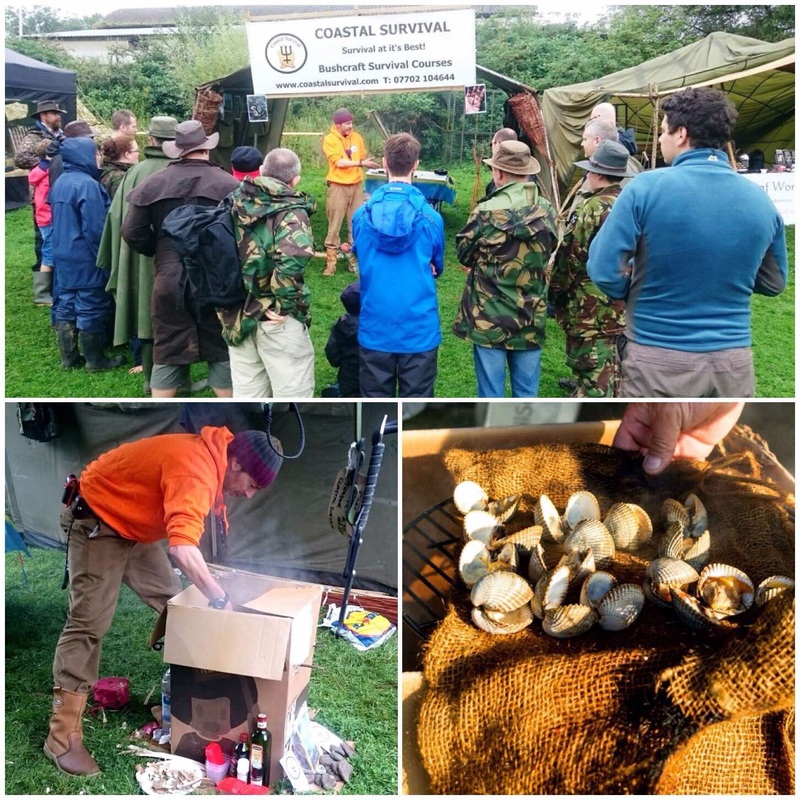 Being the Coastal Survival stand we spent time demonstrating net making and Fraser managed to get himself filmed by what looked like a very professional looking film maker. I do not know who he was but he did look the part and Fraser being a bit of an extrovert loved it. The whole weekend was very busy however I did manage to get out and see the rest of the Gathering a few times. Across from us I found Jason demonstrating his bow drill skills and getting the kids to join in with him. It was also great to catch up with Pablo, JP, Hannah and Richard from the Woodlife Trails team across the way from our stand. 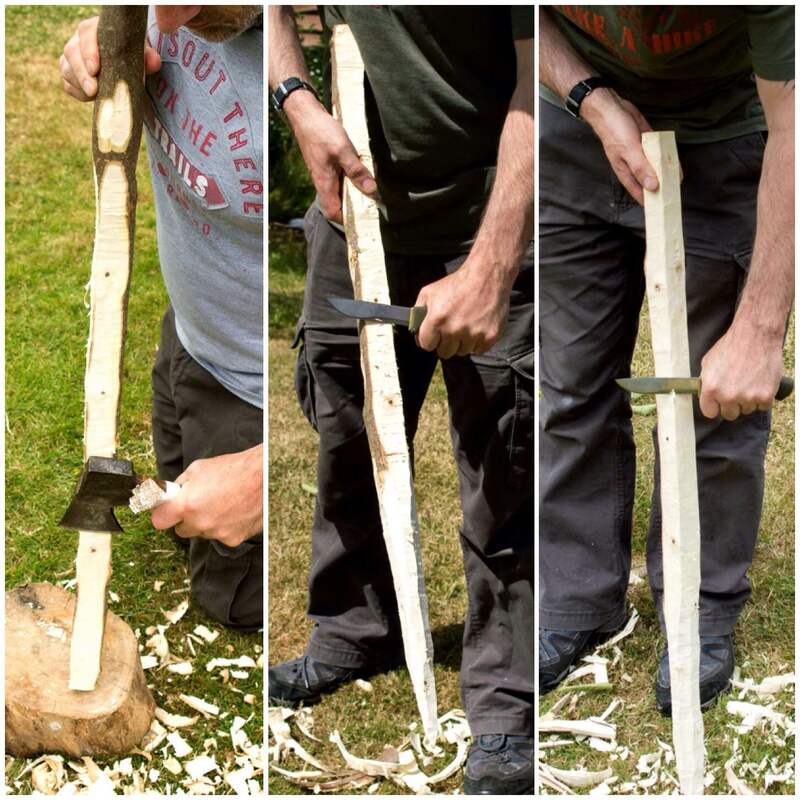 I had a great chat with Jon Mac (of Spooncarvingfirsteps fame) and was really chuffed to be allowed to handle many of the new knives he and Chris Grant are jointly working on. Jon has since gotten married since I spoke with him to Sarah so I want to extend my congratulations to them both now. While I was on the stand my friend David Willis asked if I could take some pictures of his baking class. 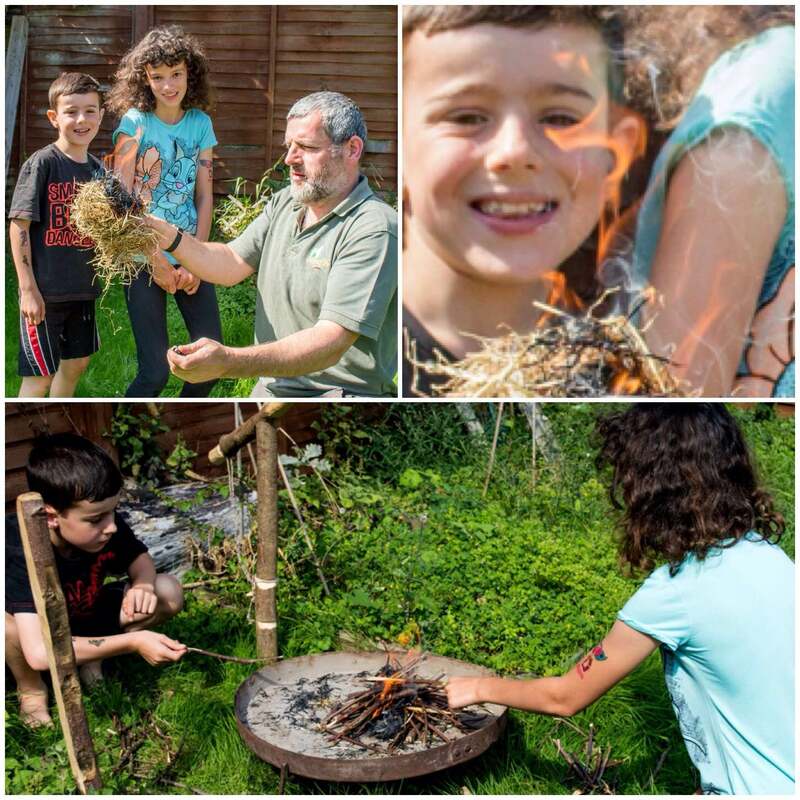 David had a busy time demonstrating and teaching folk to bake bread over an open fire. The good thing about being his photographer was that I got to test all the bread. Saturday night was another night of great music and catching up with friends and the light show was again very impressive. 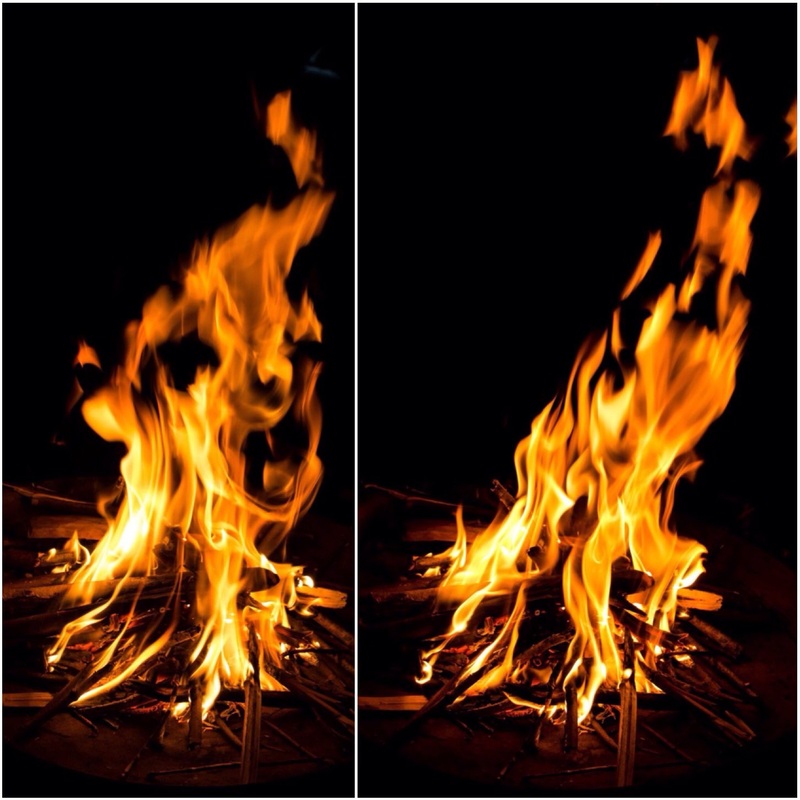 I spent quite a bit of time taking many pictures of the flames of our fire and was rewarded with these cracking Fire Faces. I can see one howler in the left hand picture and at least three faces in the right hand picture. 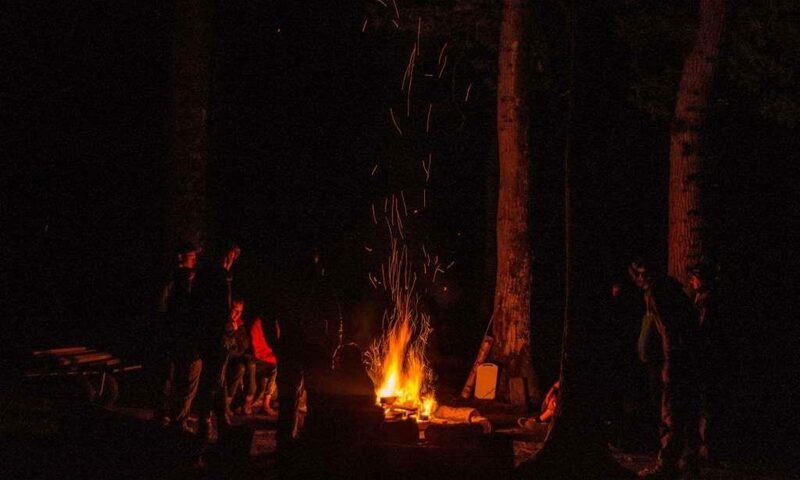 Fire Faces – How many can you see? Later that evening I spent some time with Martin Burkinshaw learning the art of low light level photography. Martin gave me some great tips and let me try out his tripod to capture the picture of the Milky Way you can see below. Sunday found me catching up with our friends Rich and Dave. Rich had recently broken his wrist however that did not stop him getting out and about, though he did take a bit of flak for his nice new black armband. 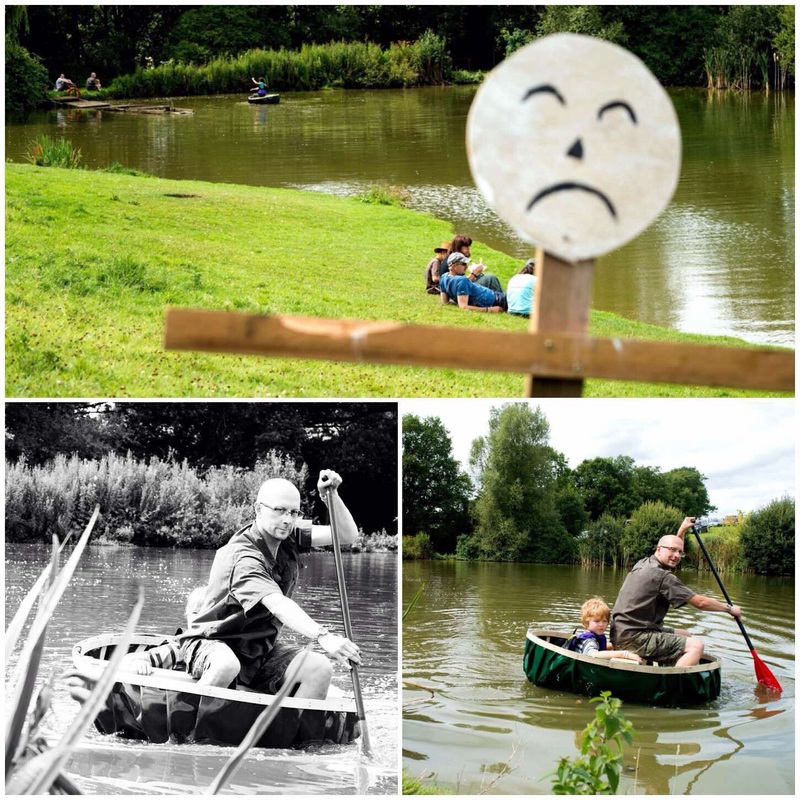 I spotted some movement on the lake on the Sunday afternoon and managed to get these great snaps of this father and son combo out for a cruise on their newly crafted coracle. 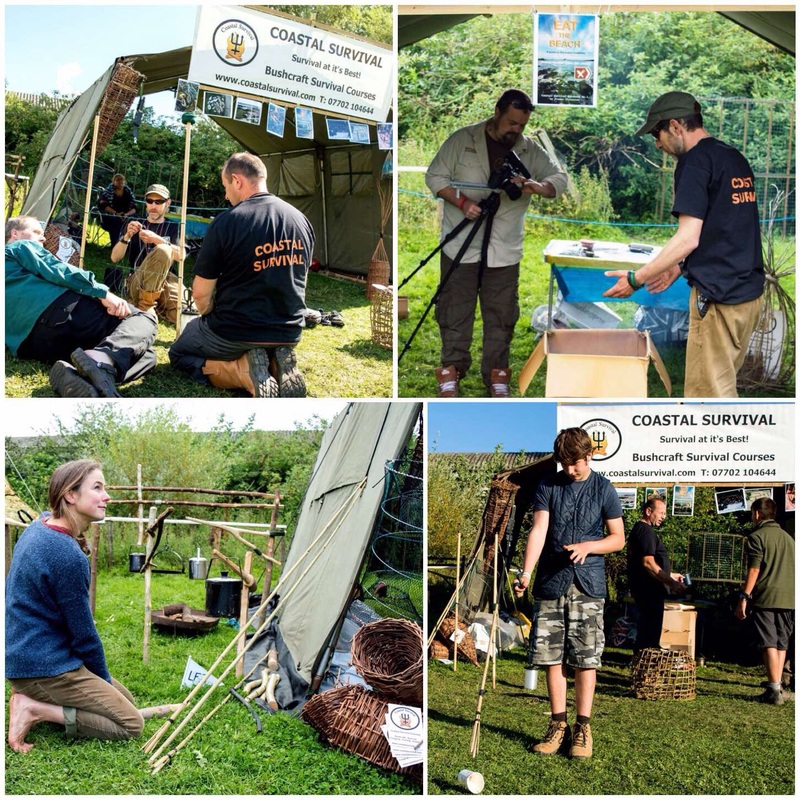 I did not get out to see as much of the Gathering as I did last year when I managed to film much of it however I had a great time teaching lots of kids how to make fishing spears and chatting with our neighbours Sonni and Angela. This year has also been a good year for Fraser’s book Eat the Beach as we managed to sell quite a few copies for him over the weekend. 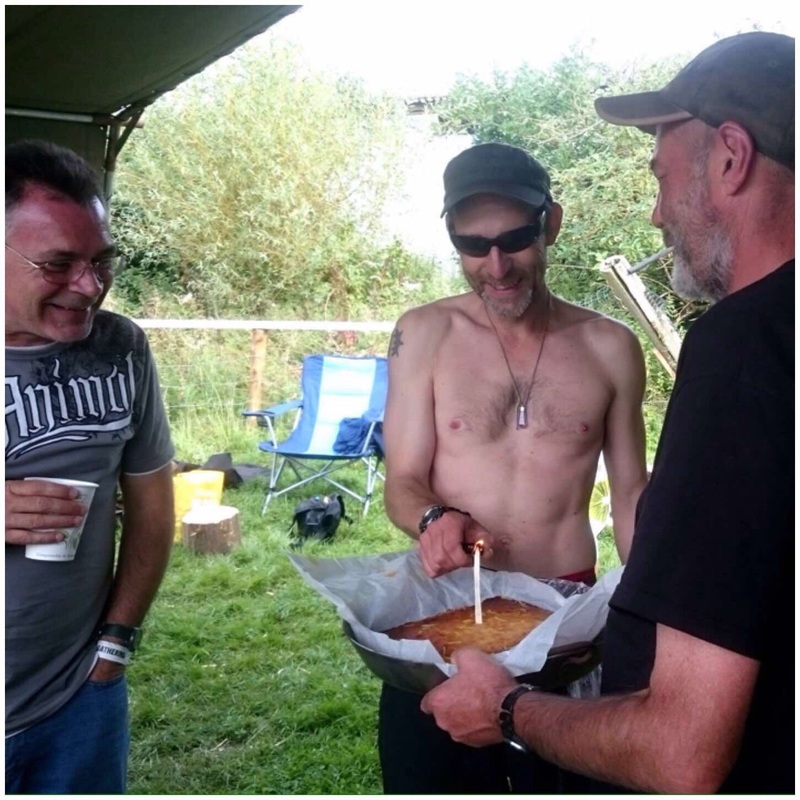 To finish up we got given a lovely Lemon Drizzle cake for free by the kitchen staff at the Gathering and somehow it ended up as a birthday cake for our own Stephen Herries. I have no idea how old he is but he was happy anyway :-). 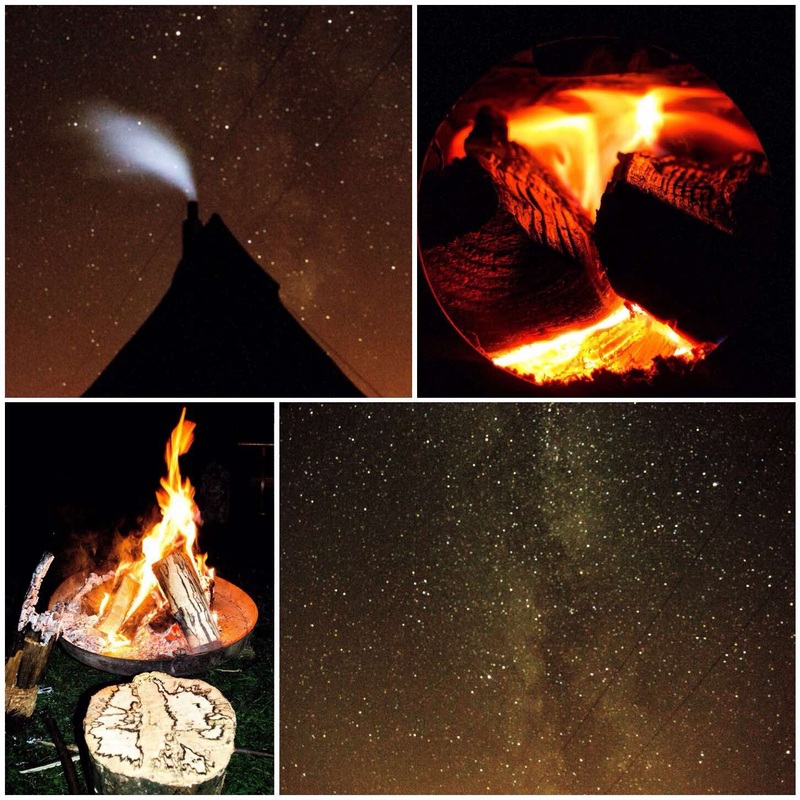 Another year over for the Wilderness Gathering however I hope it is nowhere near my last one. 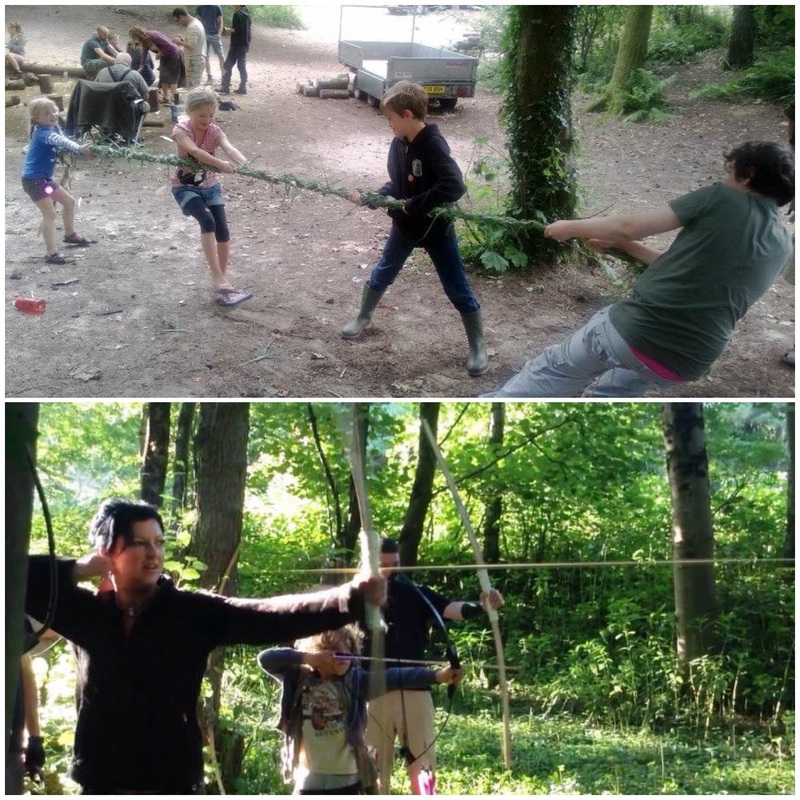 The BCUK Bushmoot is about sharing knowledge however one thing it does bring out in me is my competitive spirit. 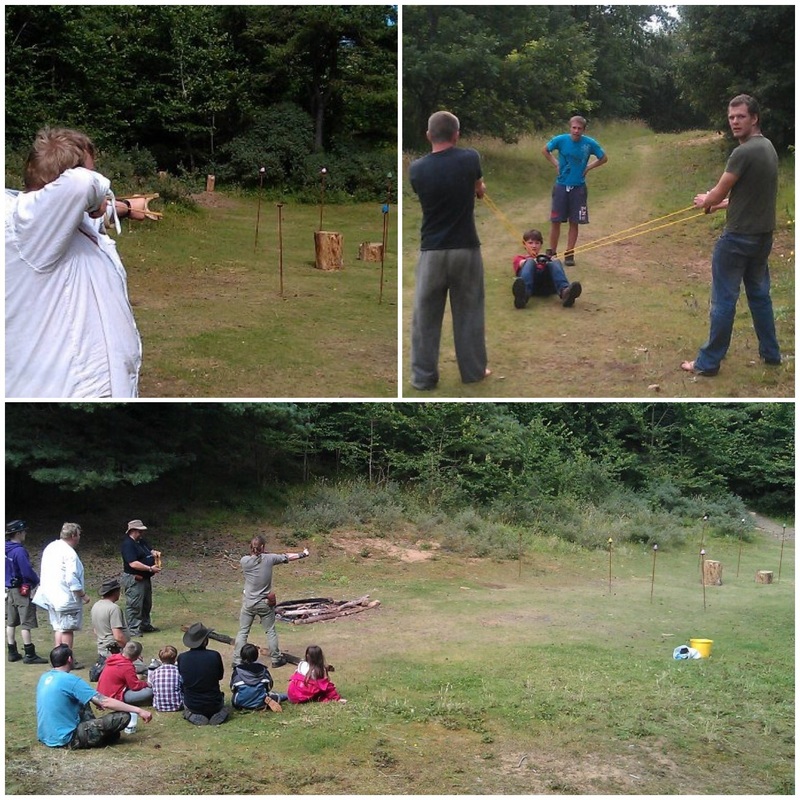 That may be through making a tug of war rope out of grass through to the serious competitiveness of the archery range. This sharing of knowledge may come about in many ways such as workshops, one to one sessions, presentations and competitions. 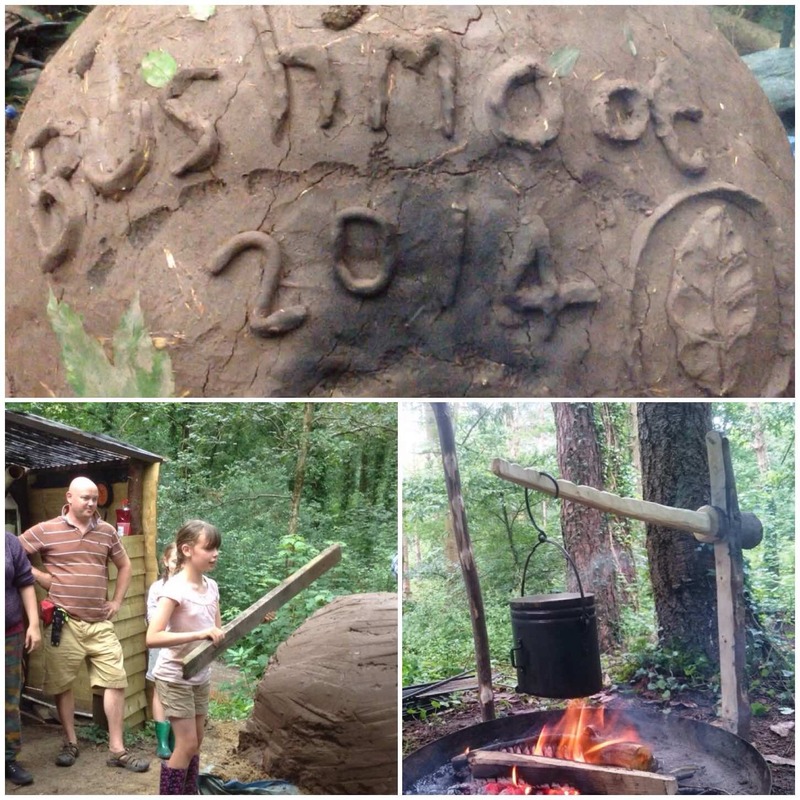 This post is focussed on the many competitive activities we undertake over the two weeks of the Bushmoot. The first picture I shared was of the grass tug of war we undertook under the watchful eye of Perry McGee from the National Tracking School. 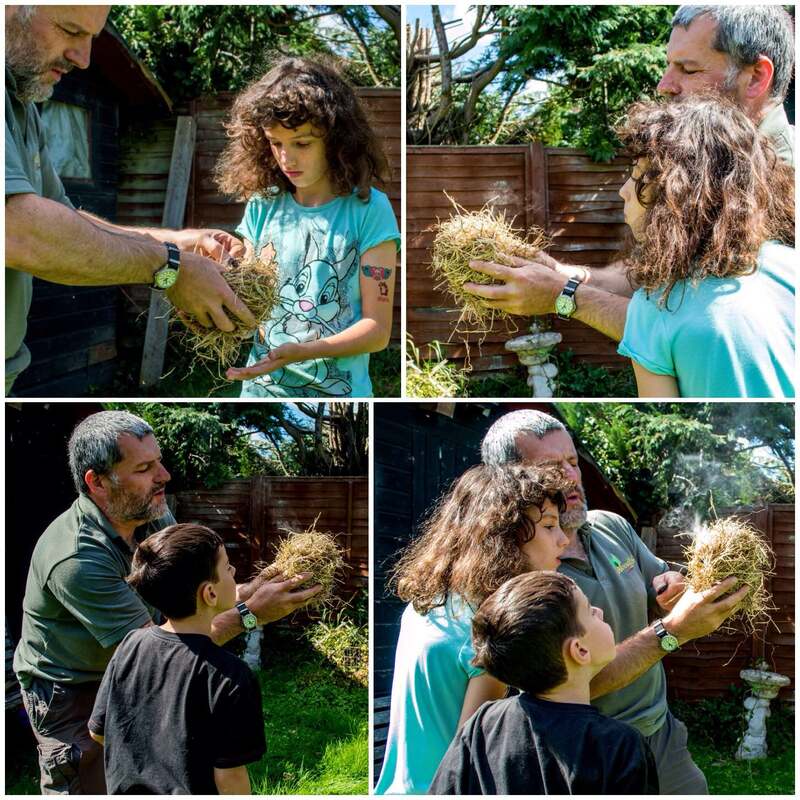 Perry showed us how to quickly gather grass, twist it, create rope and most importantly how to have fun with what we created. My friend David Colter has introduced the sling and in particular the Balearic style of sling. 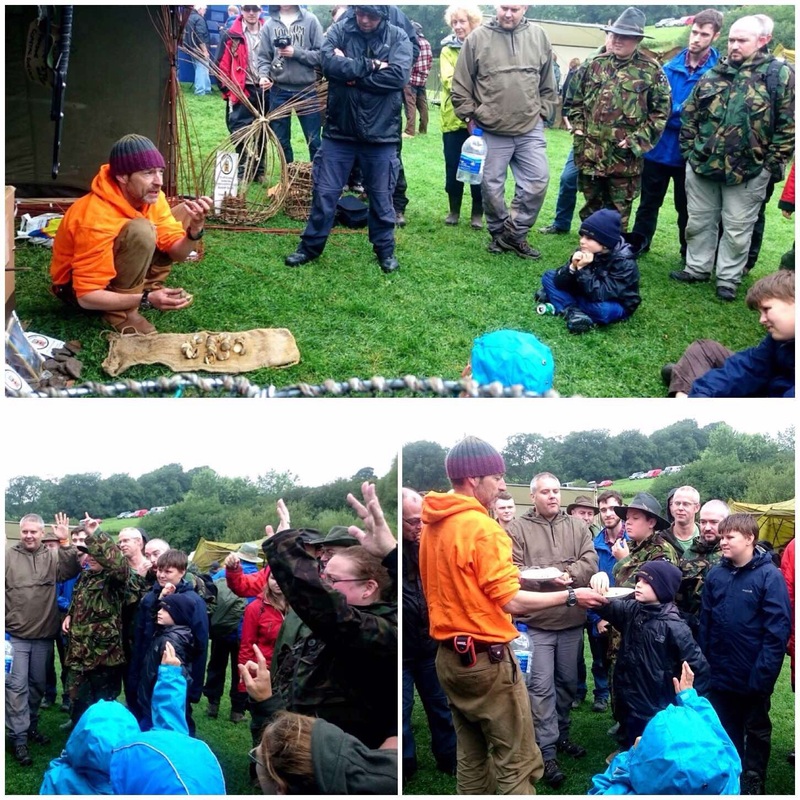 The throwers all made their own slings from string and leather and it attracted participants of all age groups. David has run classes on this for a number of years and he had a great time running a competition on the sand dunes this year. The sling throws the projectile at very high speed so I think they used tennis balls for safety’s sake. Next year David is making this official by running the Balearic slinging world championship event at the Bushmoot. 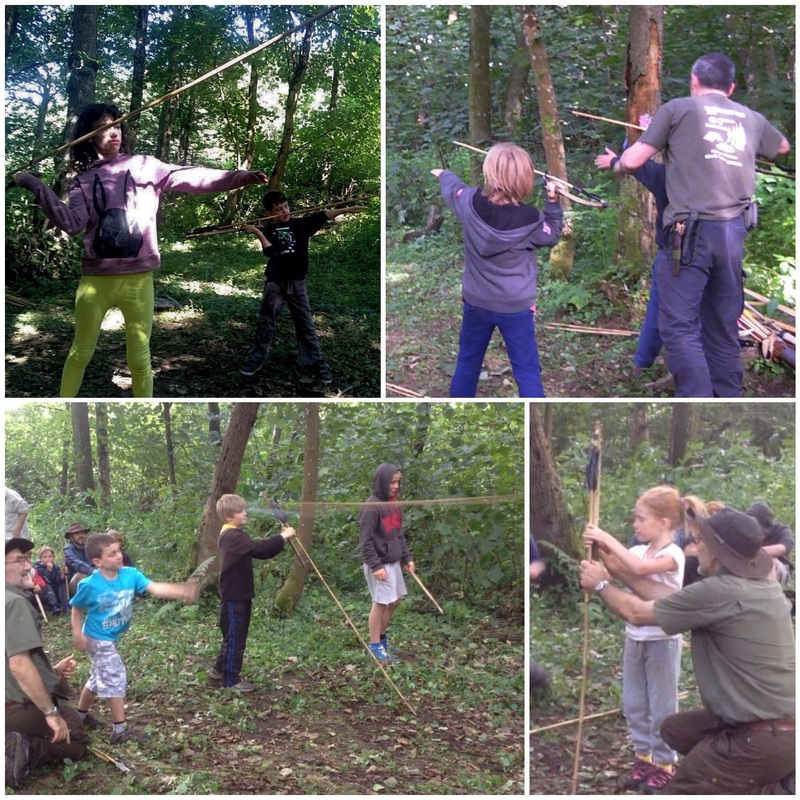 One of my favourite events is the Atlatl. 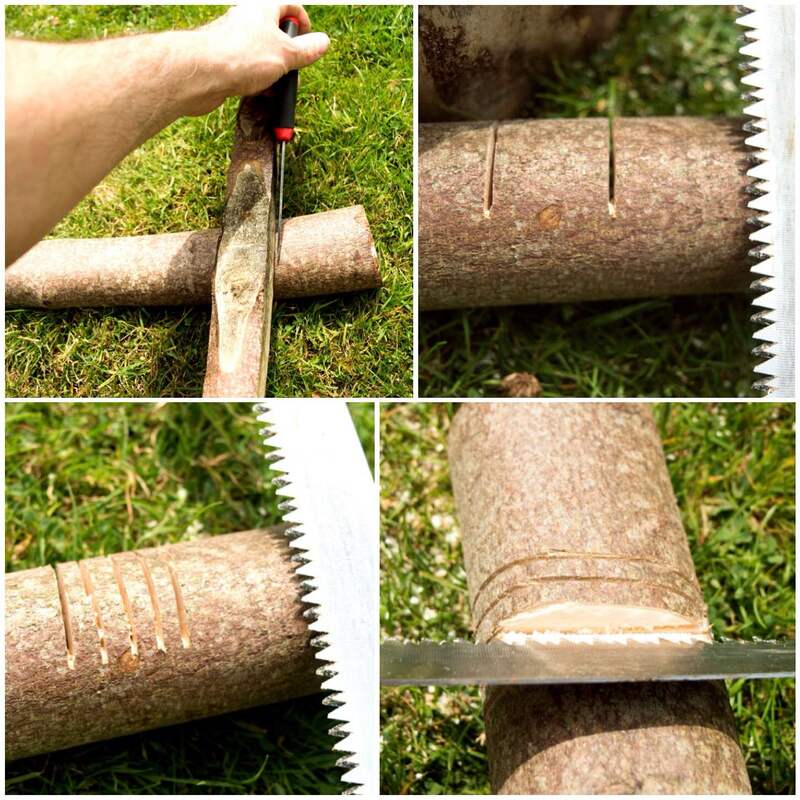 This again is a very ancient art and was (and still is in certain parts of the world) used as a hunting tool. I have lots of different types of Atlatl throwers and darts however I use unsharpened bamboo canes for training. 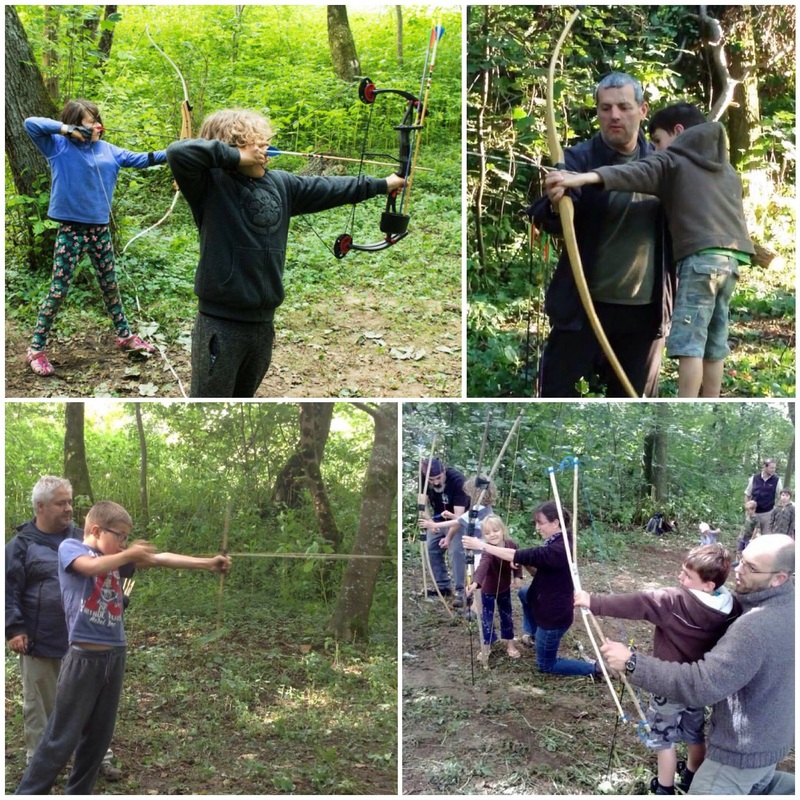 I use Atlatl throwers with rest attachments for the kids to use (they can be difficult to hold) and spend many an hour with my friend Charlie Brookes on the range teaching them to throw. 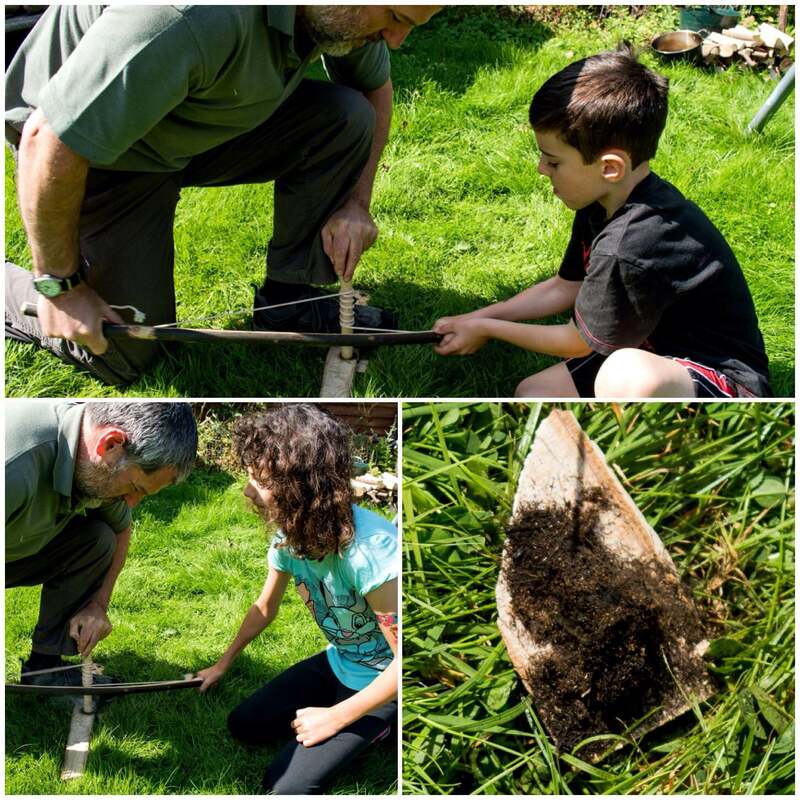 This is a particularly popular activity for kids of all ages (most adults at the Bushmoot come under this category as well) as the appeal of throwing Atlatl darts down range can be quite addictive. 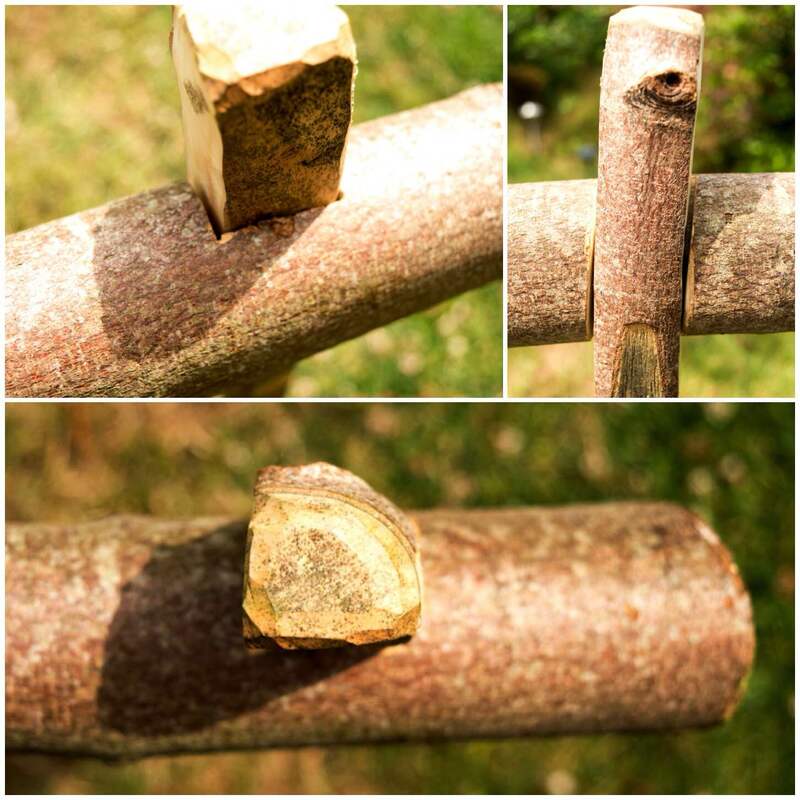 We run an axe and spade throwing range as well ( more difficult than it looks) and it provokes stiff competition. I have not done this to any great degree (though I hope to throw more next year) but it does make for great viewing and photography. 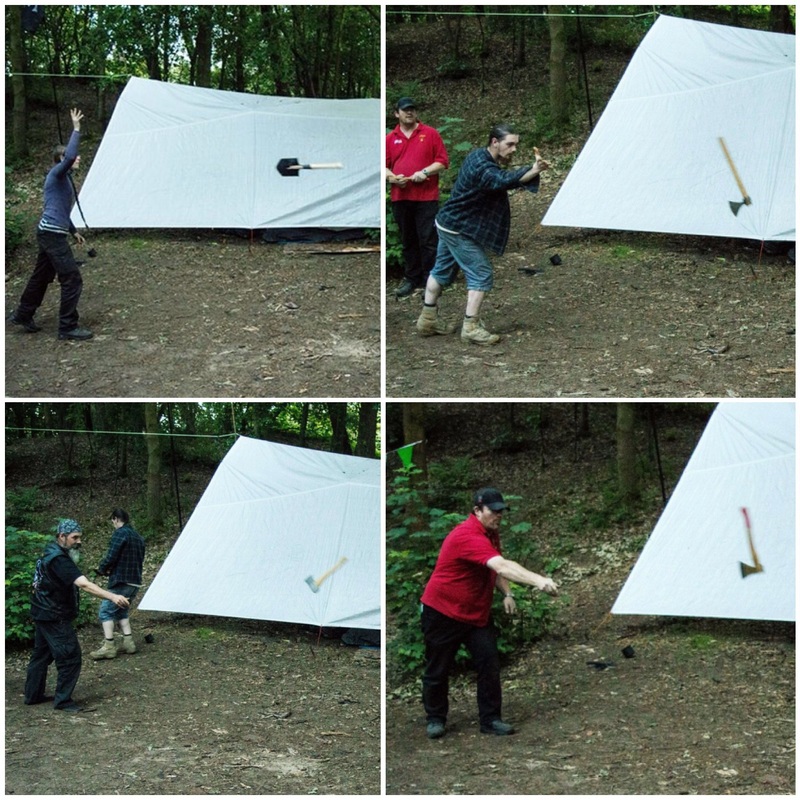 I noticed the guys were throwing next to Cap’n Badger’s white tarp and positioned myself to try and capture the axes and spades in flight. Needles to say I had my lens well zoomed in and the shutter speed really fast. 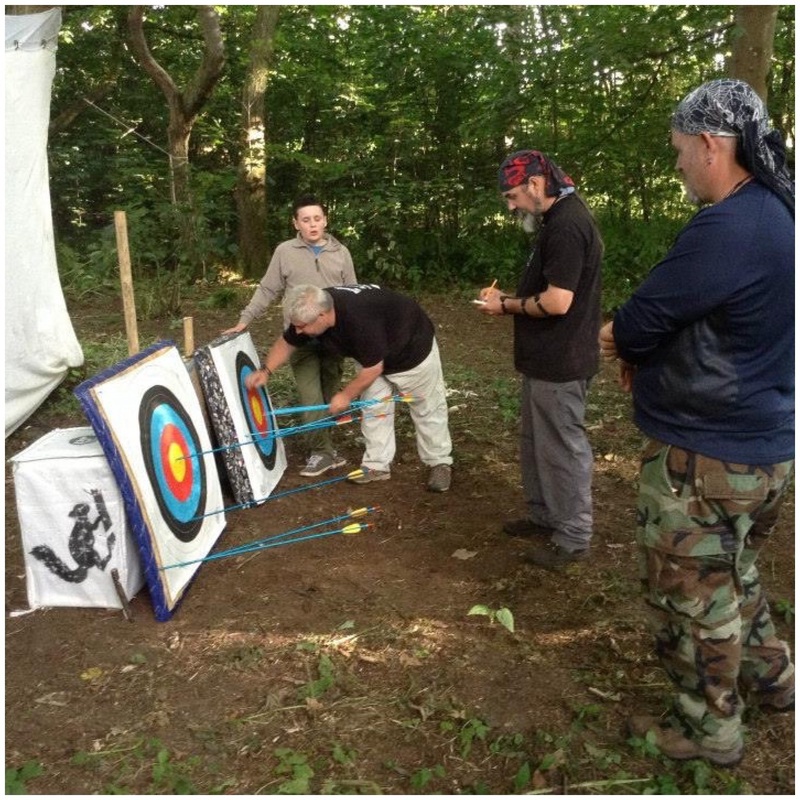 Each year we (that is usually Cap’n Badger, Paul Pomfrey and myself) run the archery range for an hour or two in the evening. This allows anyone who wants time to get in a bit of practice. 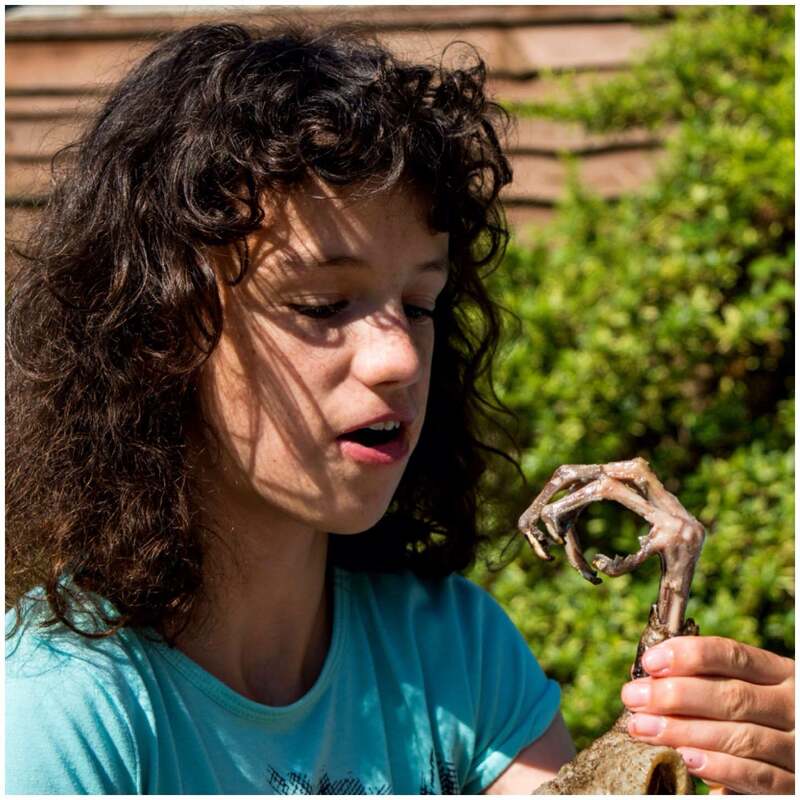 We run lots of classes for the kids offering tuition or time for parents to teach their own kids. 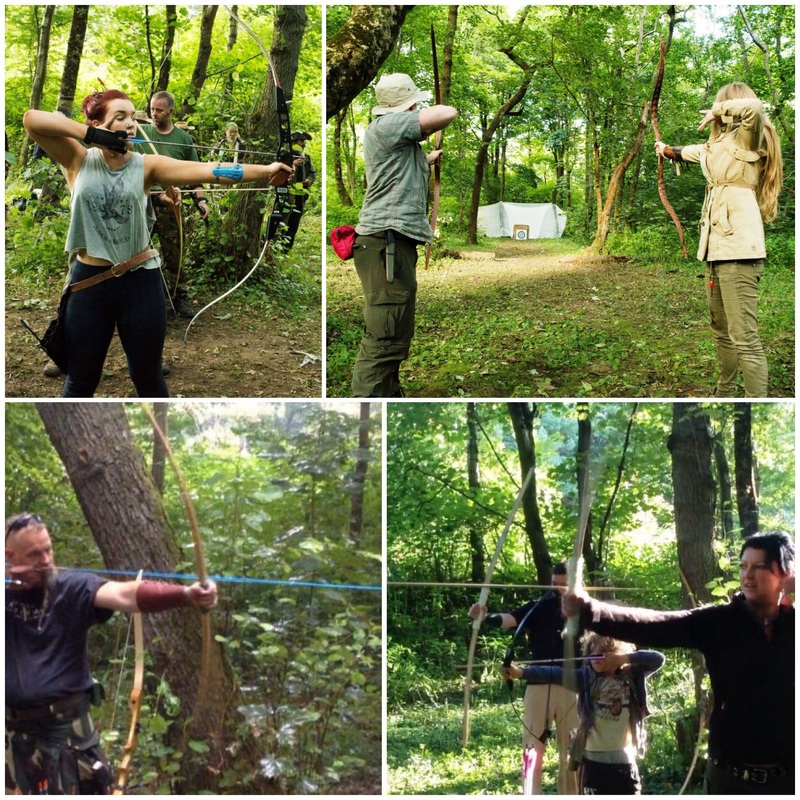 For many who come to the Bushmoot this is the first time they have ever shot a bow. Many of the bows are made on site including the Bhutenese bows (with Wayne Jones) and the Father and Son bows by Chris Pryke (I used to make these at the Bushmoot as well). 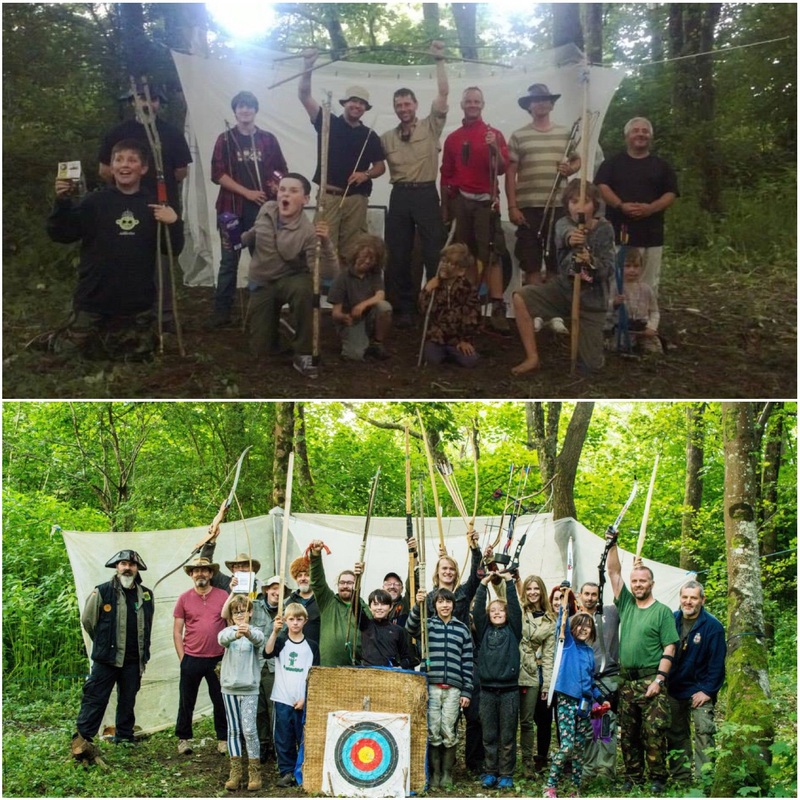 The archery range is situated well away from the main camping area in the centre of a beautiful copse. The range is managed well by a core team and there is plenty of time to practise before the competition. 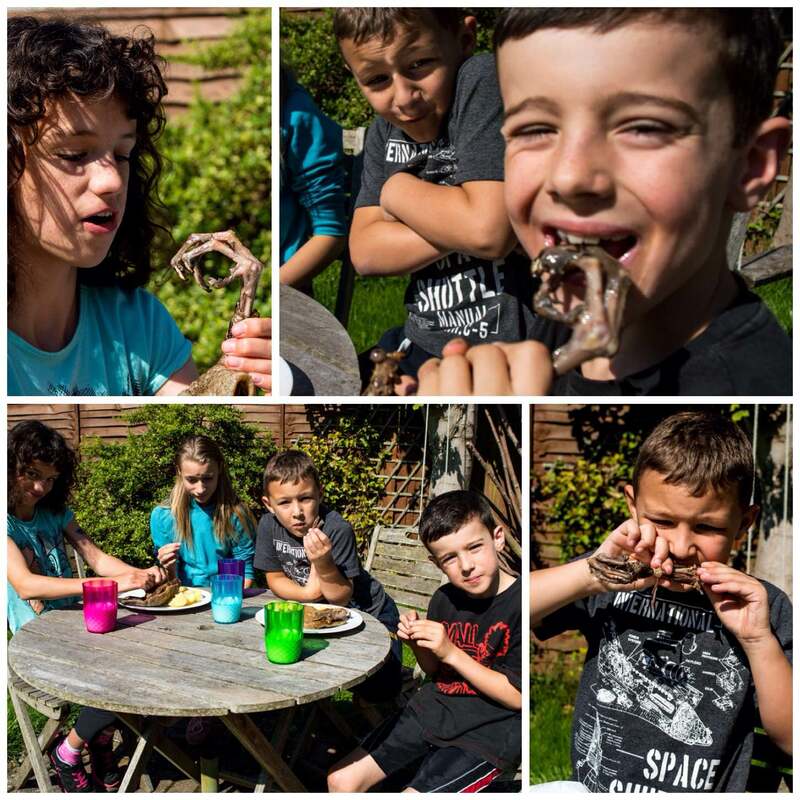 We have a competition for the kids and one for the adults. Everyone who enters brings a present along and we also have prizes donated by others so the so the spirit of competitiveness can be quite fierce. Usually we have three rounds of shots at different distances and the judges make sure everything is tallied up correctly. The award ceremony is always great fun (especially as the scores are read out) and everyone walks away with at least one prize. 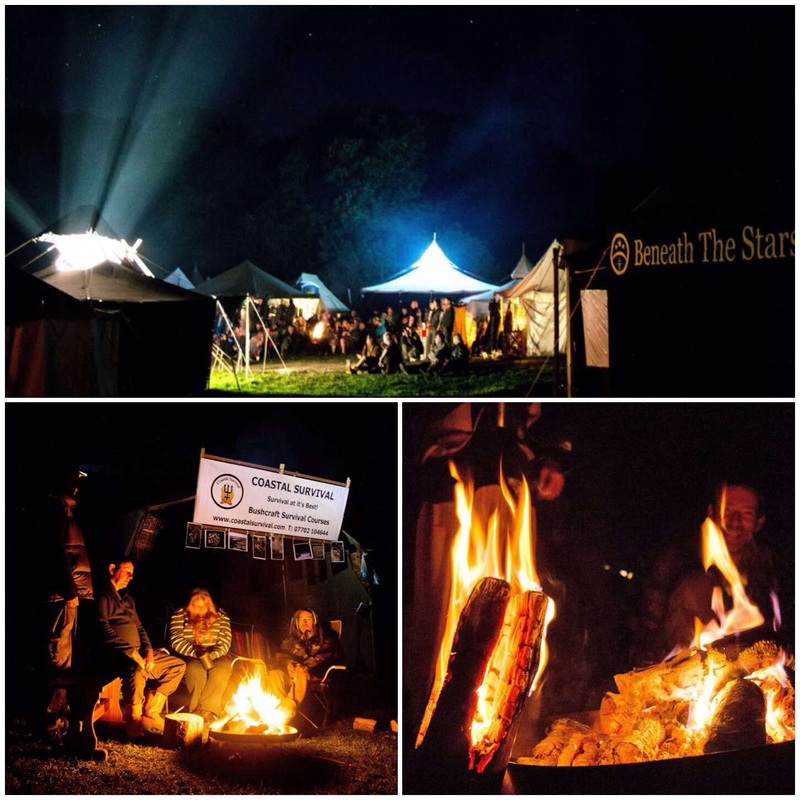 As the years have gone by and the competition has become a normal part of the Bushmoot many people look forward to this event so that they can walk away as champion. See some of you there next year.